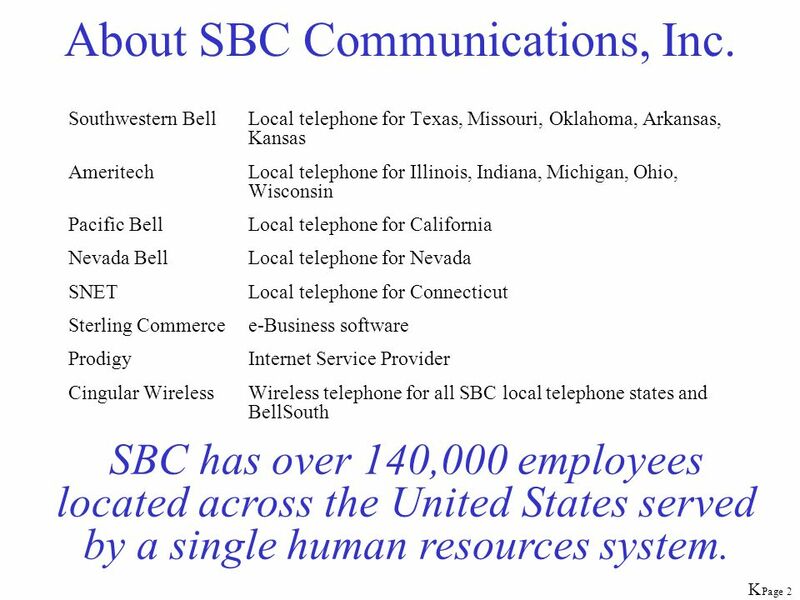 2 About SBC Communications, Inc. 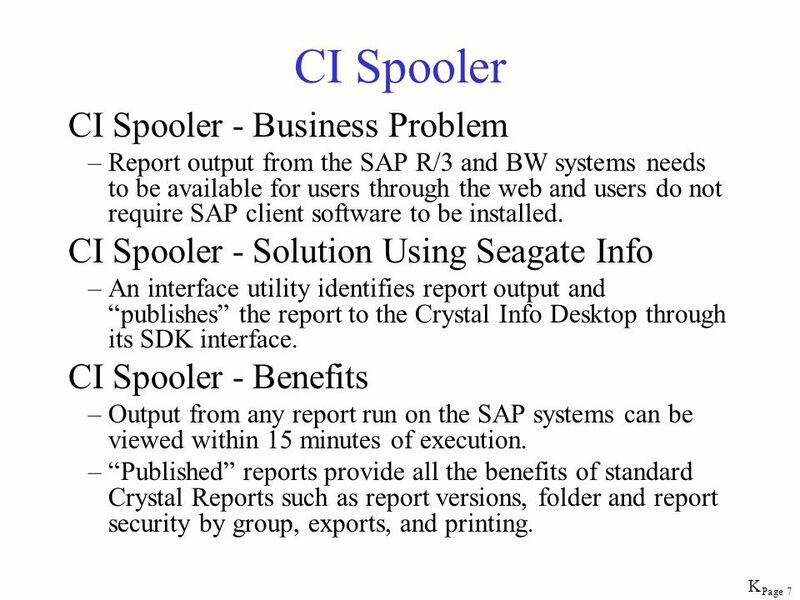 The CI Spooler recognizes reports by Program ID. 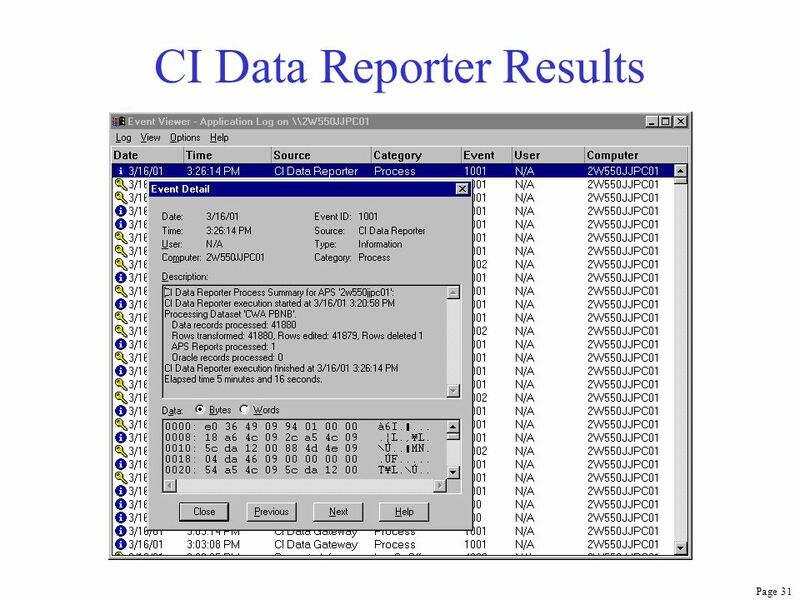 When the spooler locates the text “Program:” within the beginning of the report file, the Program ID is located. The identified report is looked up in the Control Table to determine processing. 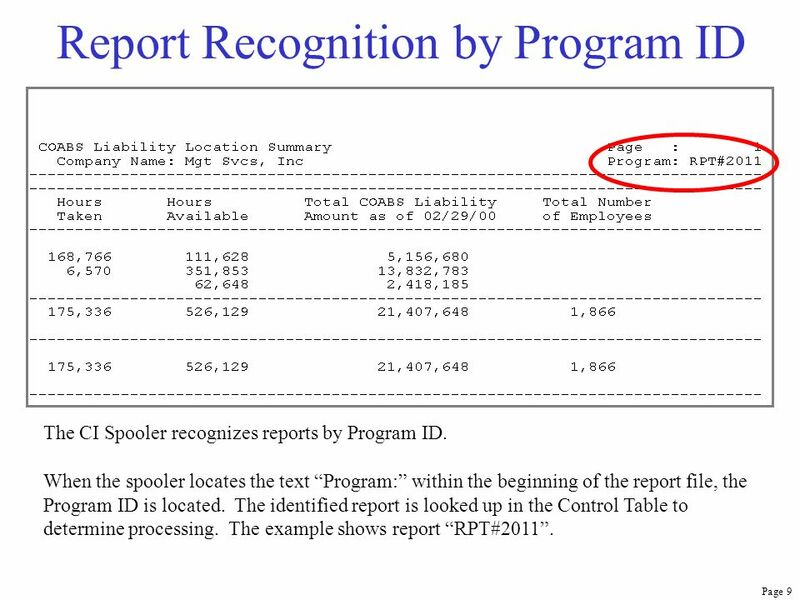 The example shows report “RPT#2011”. 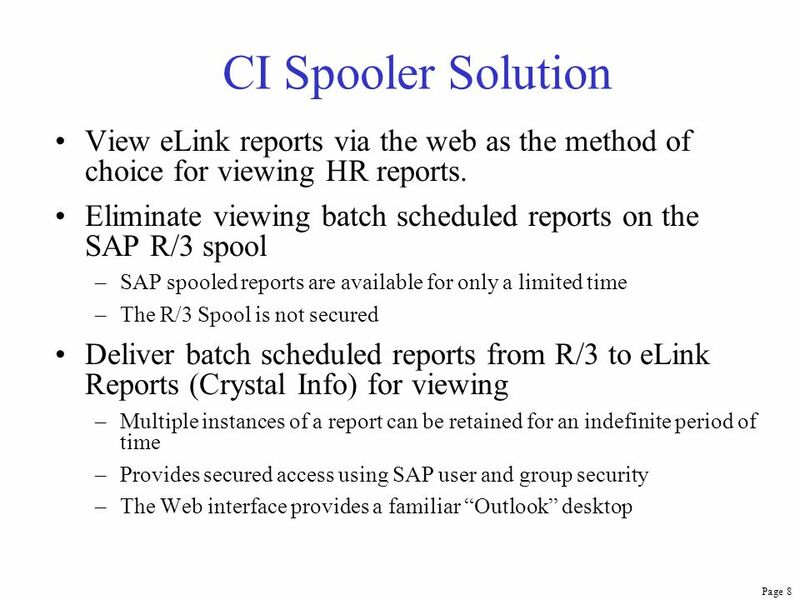 The CI Spooler recognizes reports by Report Title. 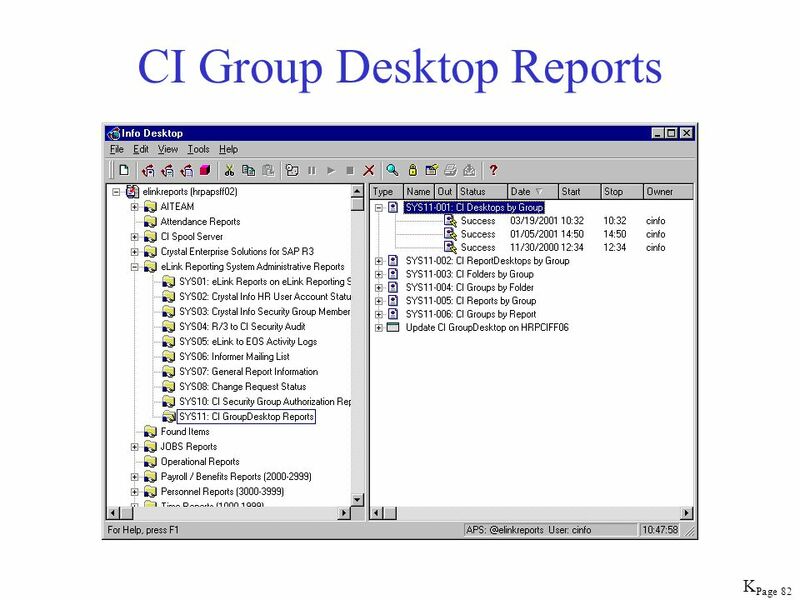 The spooler scans the beginning of the report file and attempts to locate configured report titles. 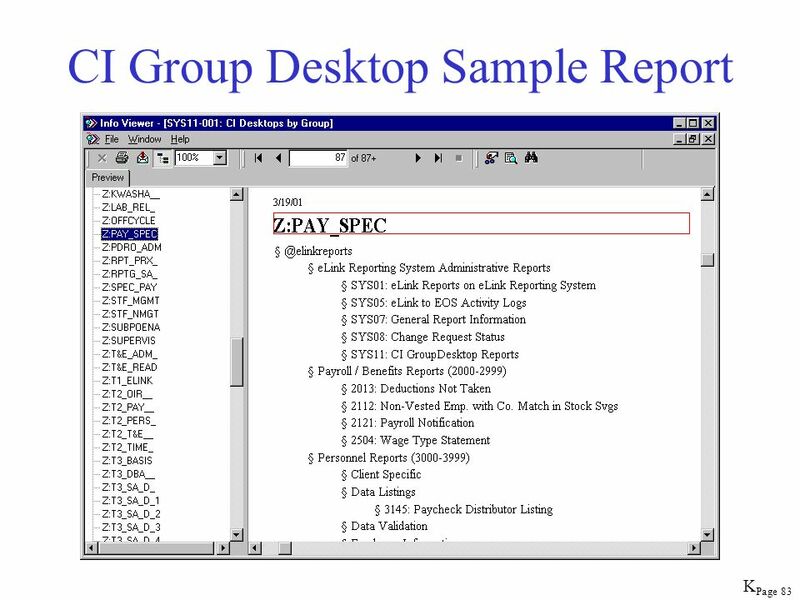 Once a title is located, the identified report is looked up in the Control Table to determine processing. 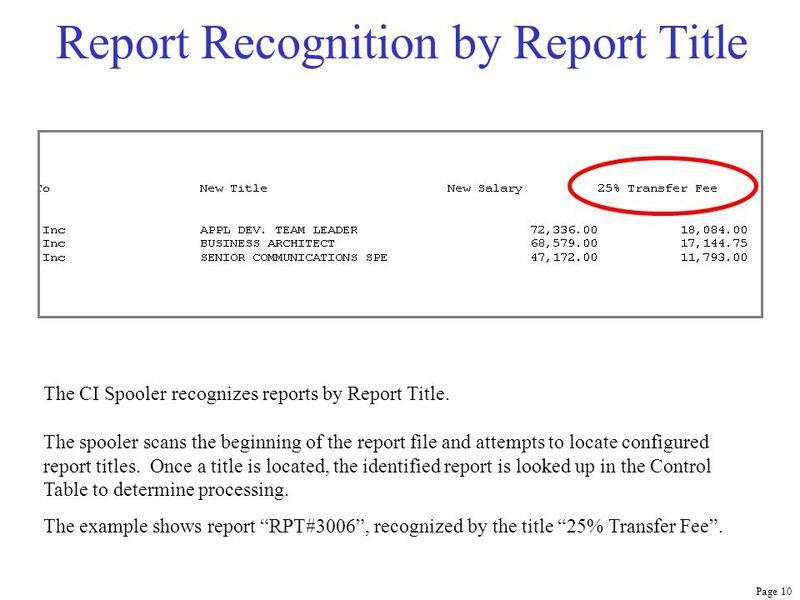 The example shows report “RPT#3006”, recognized by the title “25% Transfer Fee”. 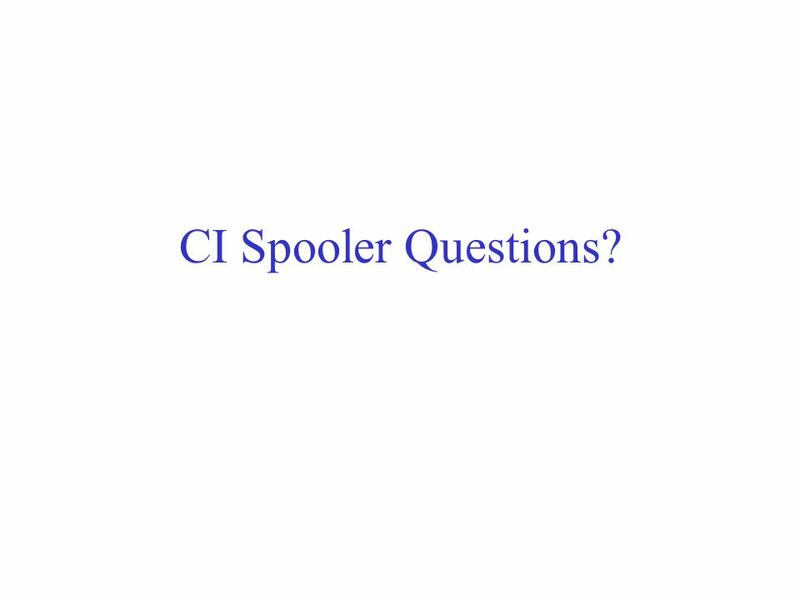 The CI Spooler recognizes report variants. 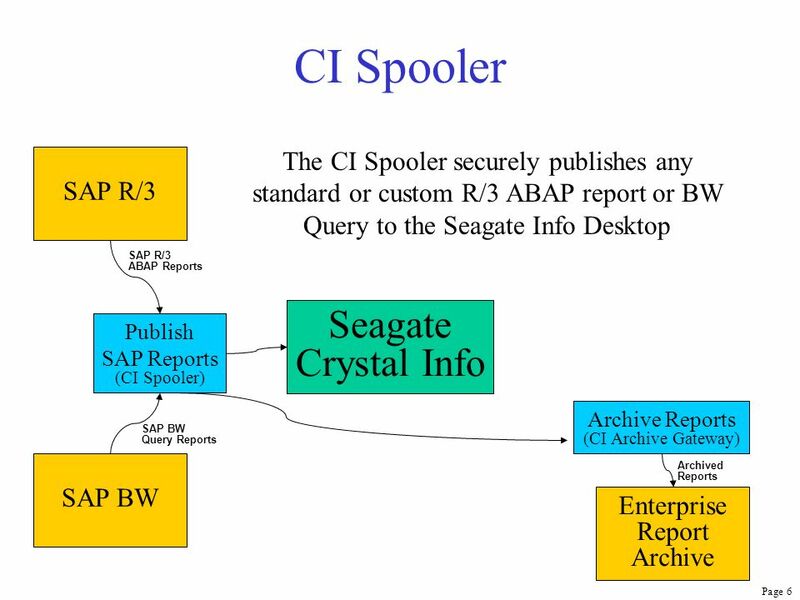 Once a report is identified by Program ID or Report Title, the spooler looks up the report’s variants in its configuration tables. 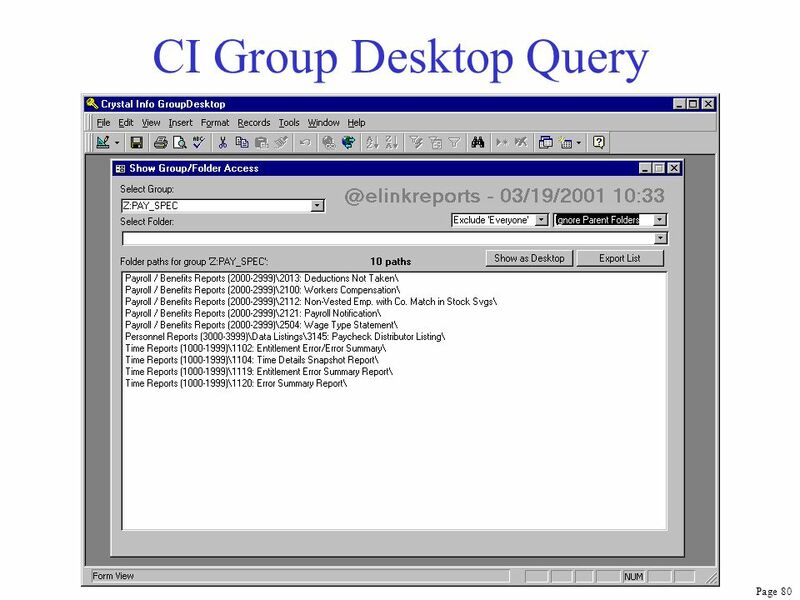 The spooler re-scans the beginning of the report file and attempts to locate configured report variants. 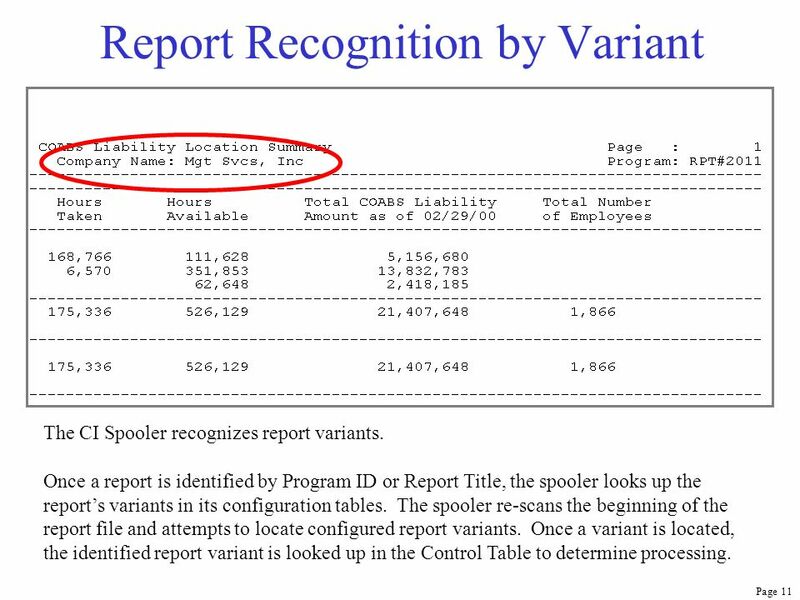 Once a variant is located, the identified report variant is looked up in the Control Table to determine processing. 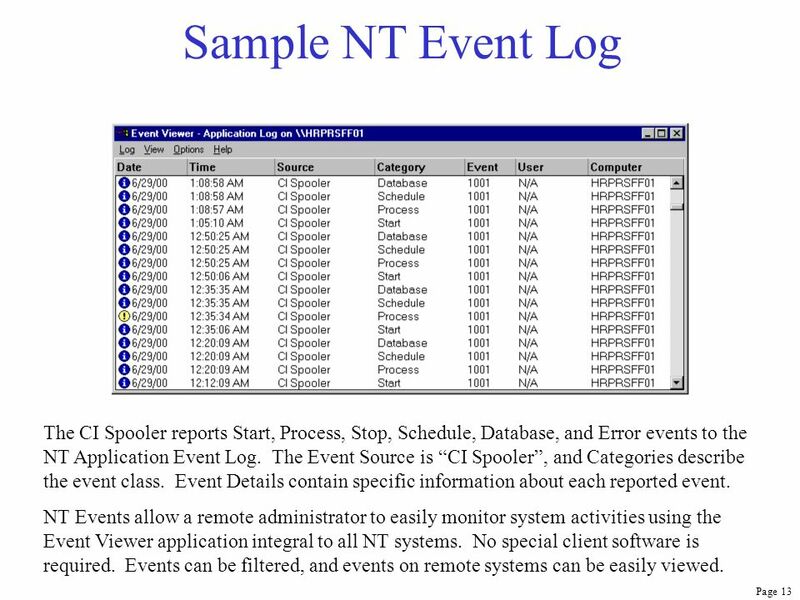 13 Sample NT Event Log The CI Spooler reports Start, Process, Stop, Schedule, Database, and Error events to the NT Application Event Log. 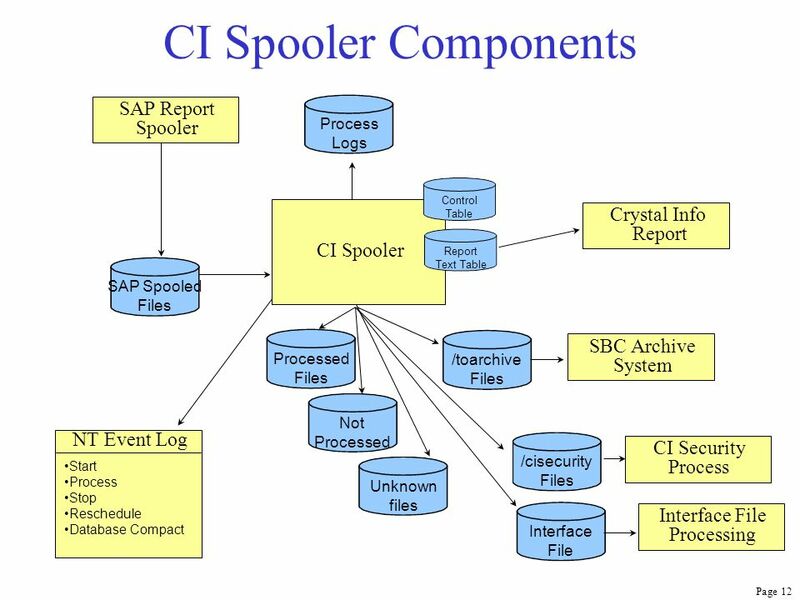 The Event Source is “CI Spooler”, and Categories describe the event class. Event Details contain specific information about each reported event. 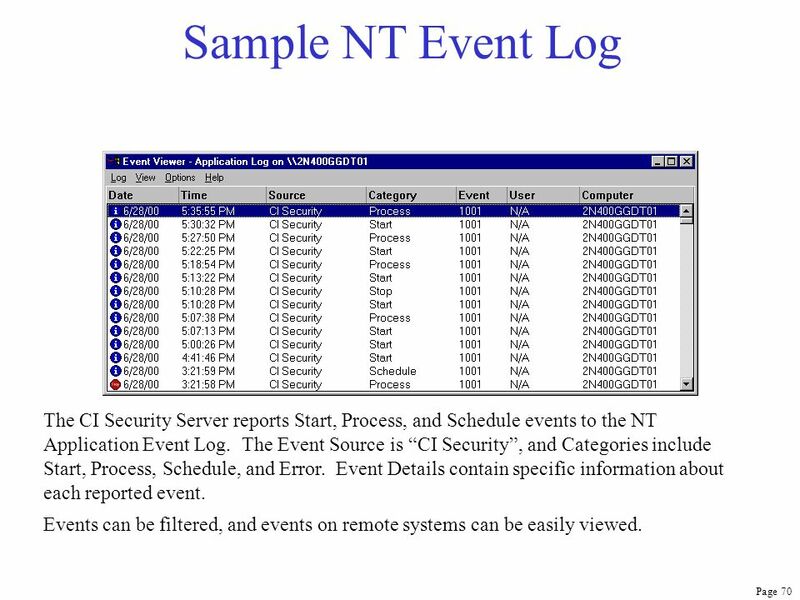 NT Events allow a remote administrator to easily monitor system activities using the Event Viewer application integral to all NT systems. No special client software is required. 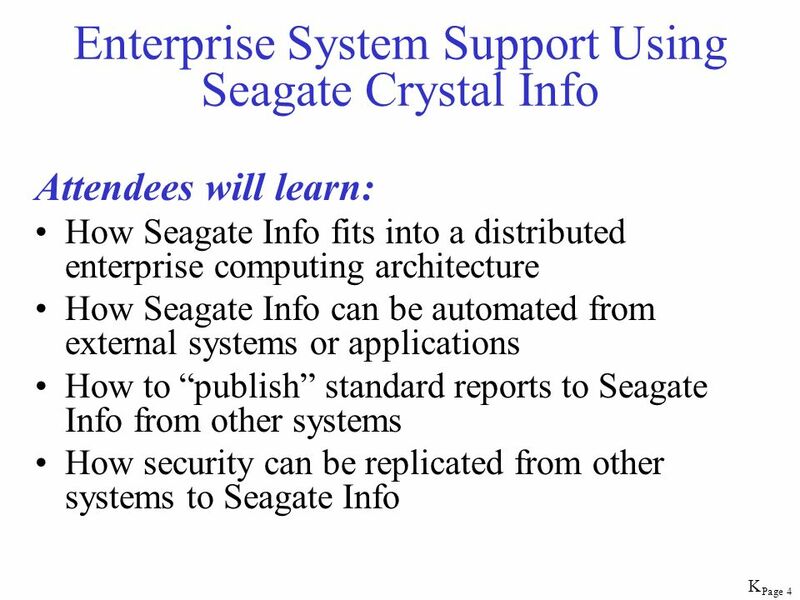 Events can be filtered, and events on remote systems can be easily viewed. 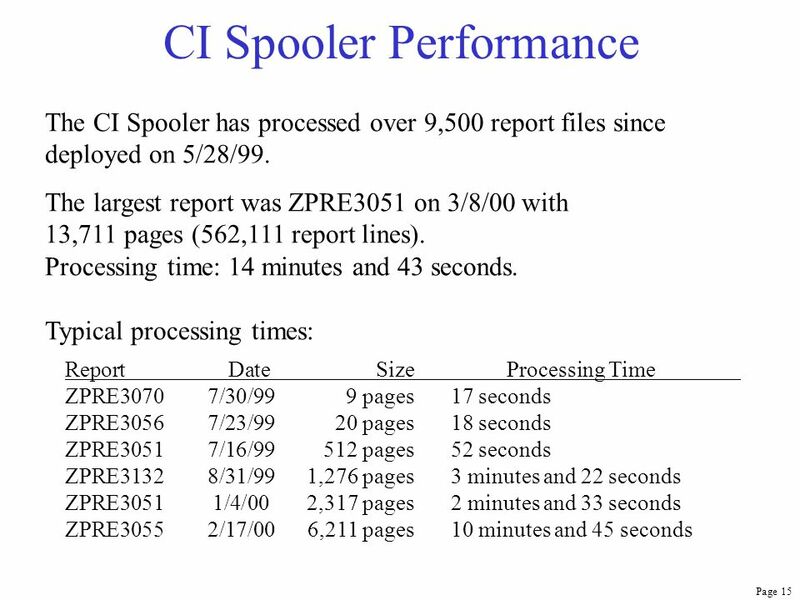 After processing spooled files, the CI Spooler reports a processing summary within the Process event. 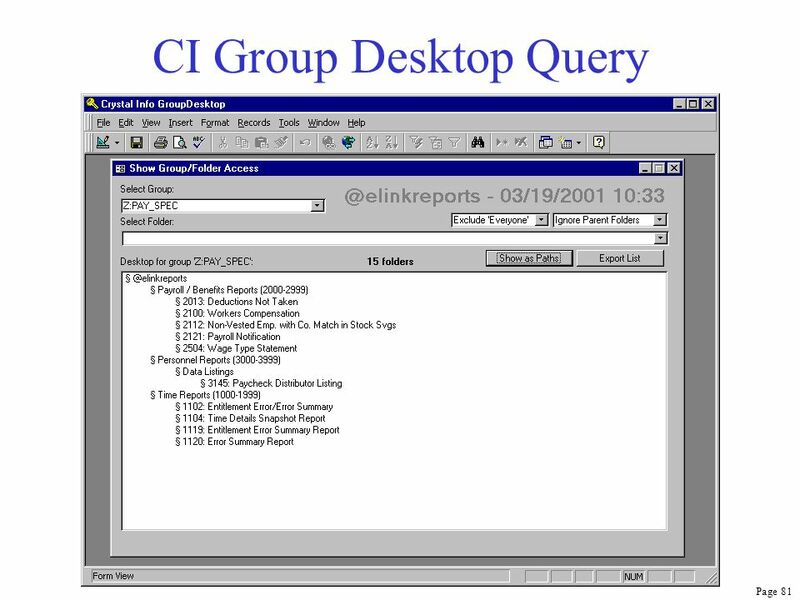 The summary includes file counts by processing type. Time details include the start time, stop time, and elapsed time. 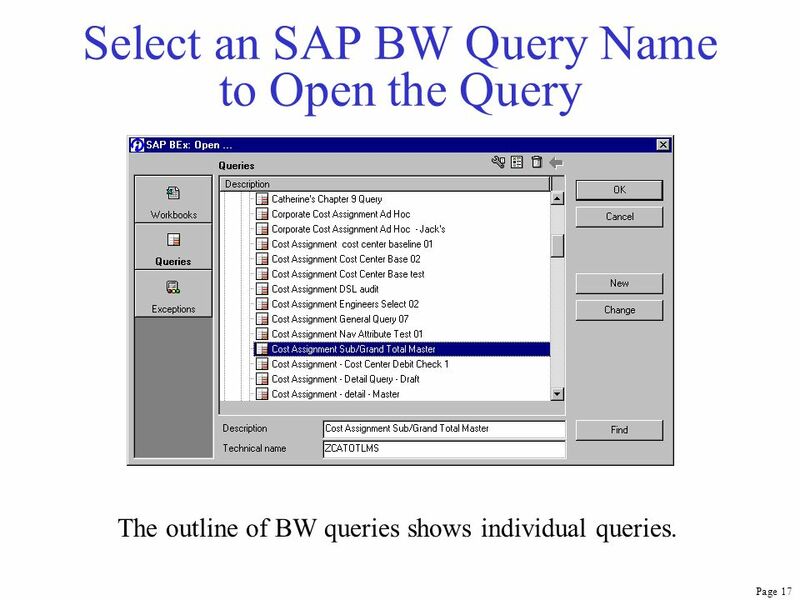 16 The Query catalog shows an outline of BW queries. 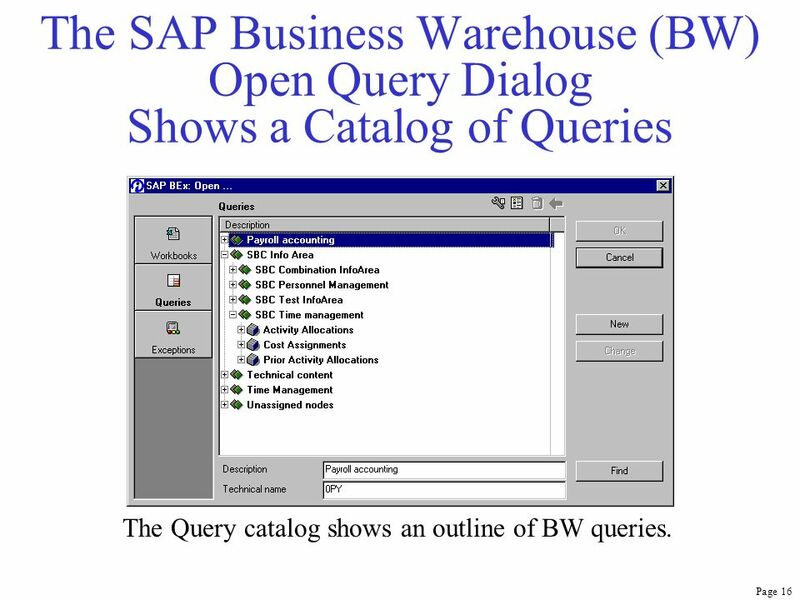 The SAP Business Warehouse (BW) Open Query Dialog Shows a Catalog of Queries The Query catalog shows an outline of BW queries. 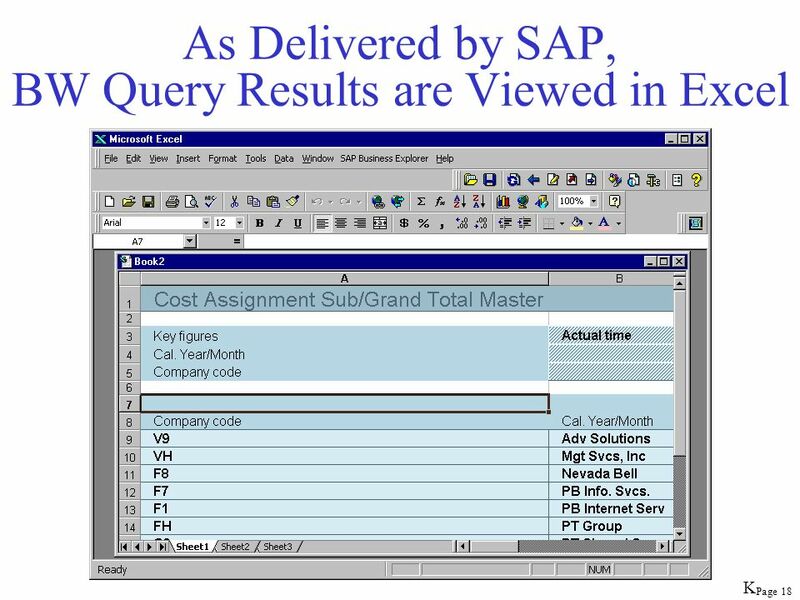 The outline of BW queries shows individual queries. 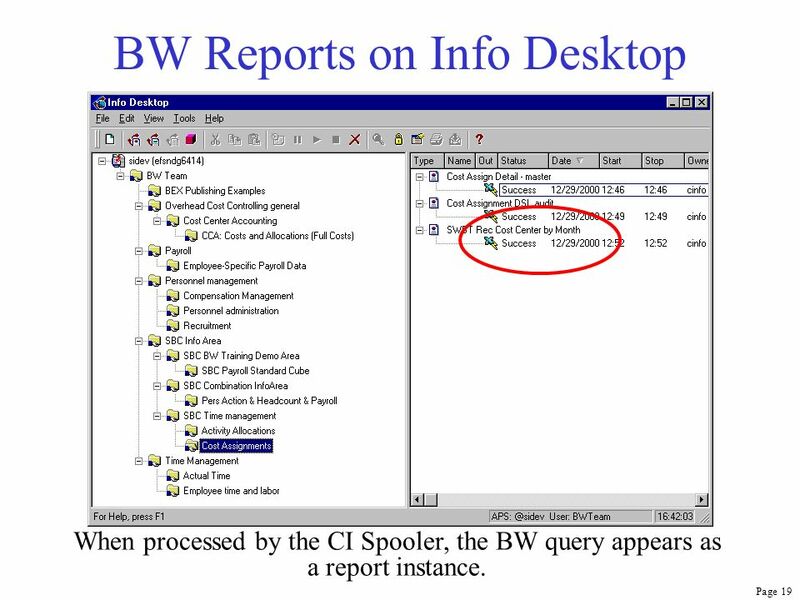 When processed by the CI Spooler, the BW query appears as a report instance. 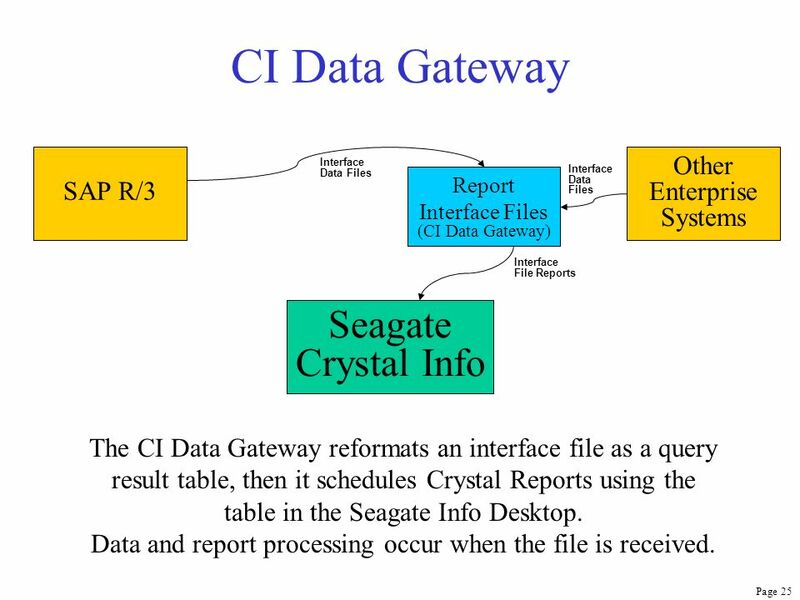 Interface Data Files Interface Data Files Report Interface Files (CI Data Gateway) Interface File Reports Seagate Crystal Info The CI Data Gateway reformats an interface file as a query result table, then it schedules Crystal Reports using the table in the Seagate Info Desktop. 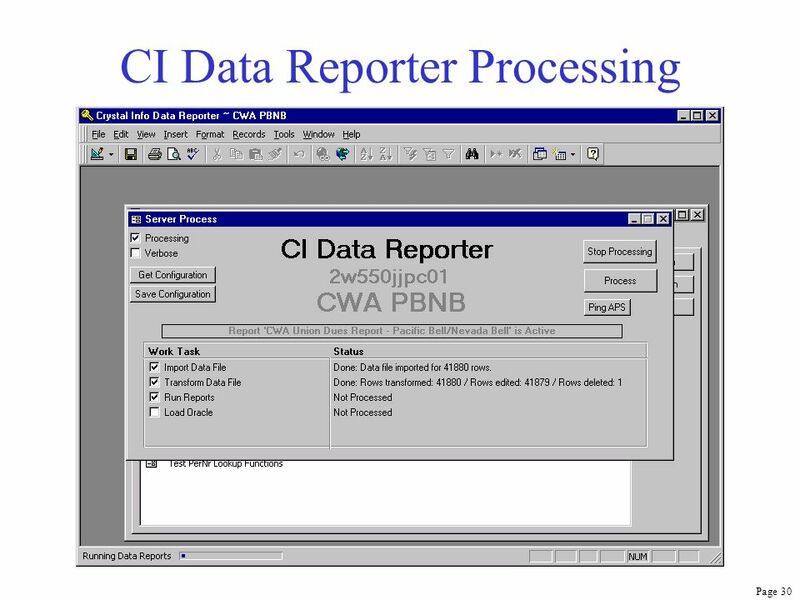 Data and report processing occur when the file is received. 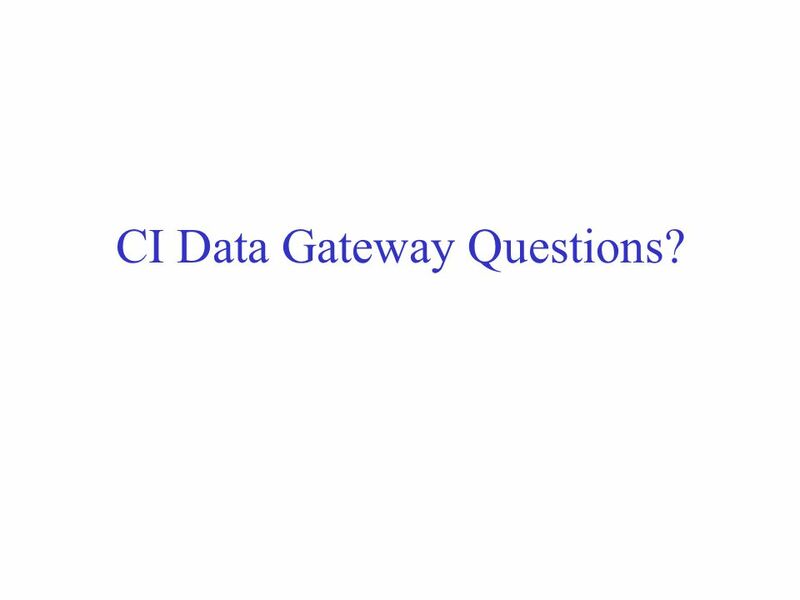 34 CI Data Gateway Questions? 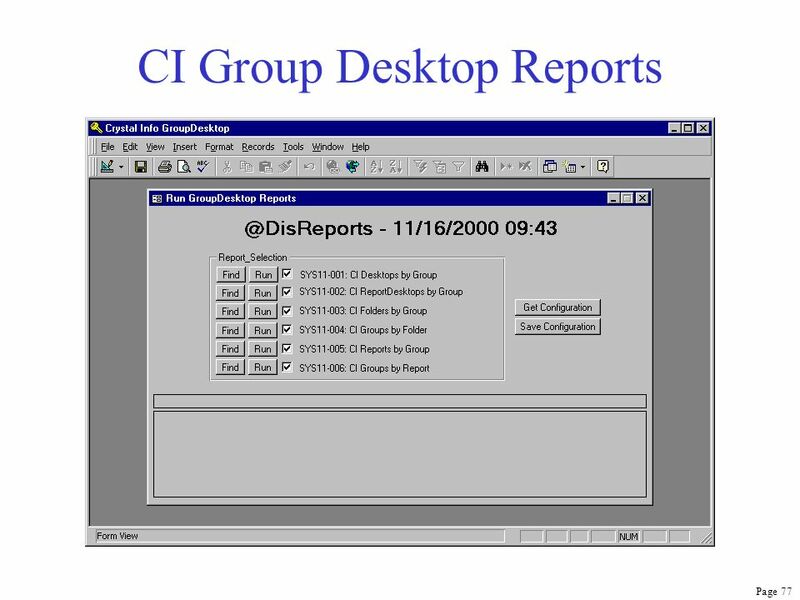 Report archiving is the on-line retention of electronic reports for more than one year. 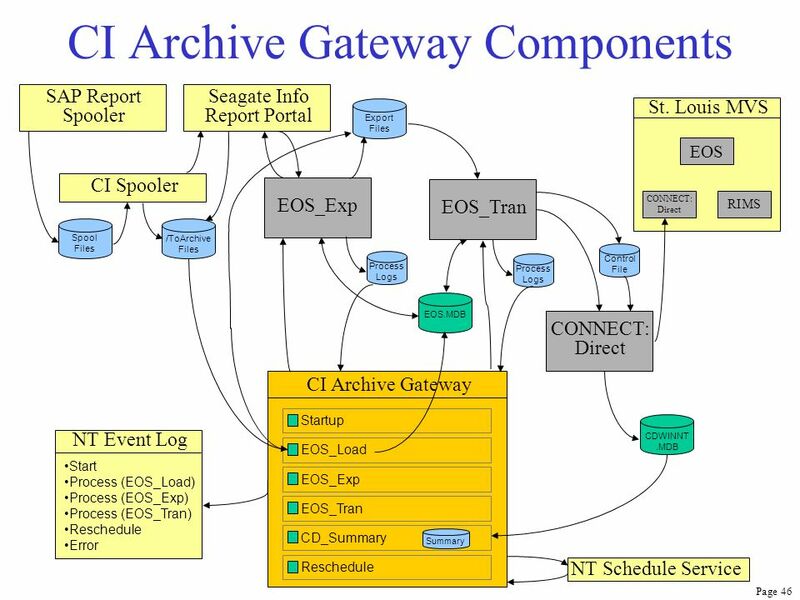 SBC archives reports using the EOS (Enterprise Output System) implemented on MVS mainframe computers in St. Louis. 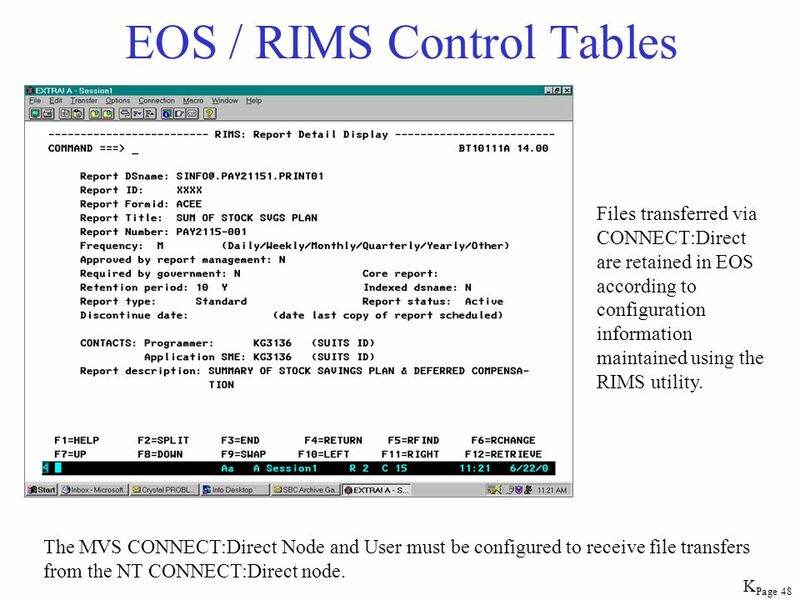 The Report Archiving process transfers reports to the EOS system from NT environments, using plain text format. 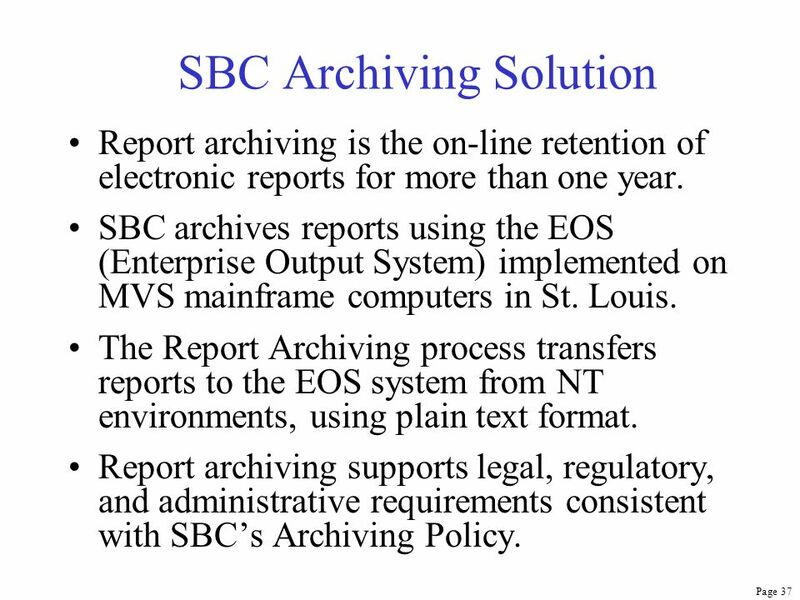 Report archiving supports legal, regulatory, and administrative requirements consistent with SBC’s Archiving Policy. Long distance large file transfers are assured through the use of CONNECT:Direct as the file transfer communications mechanism. 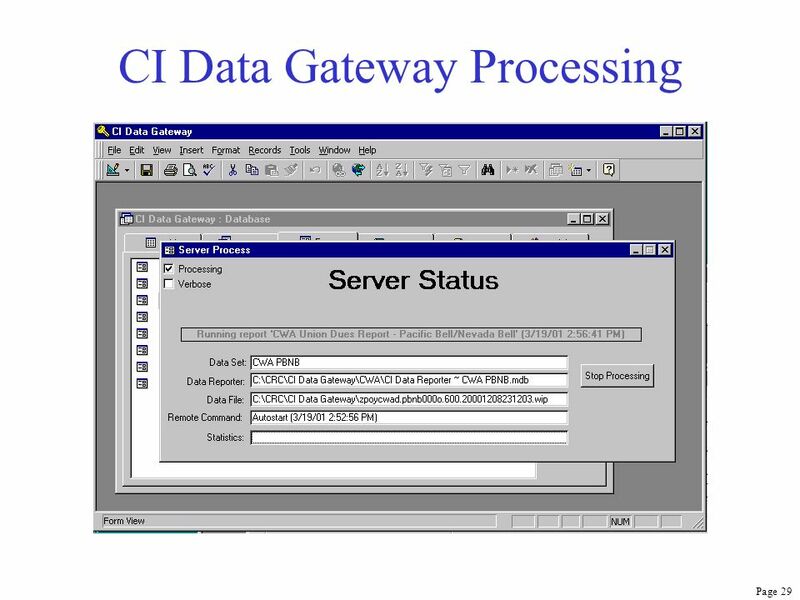 CONNECT:Direct provides status, work queues, and activity logs using bi-directional communications with data transfer acknowledgement. 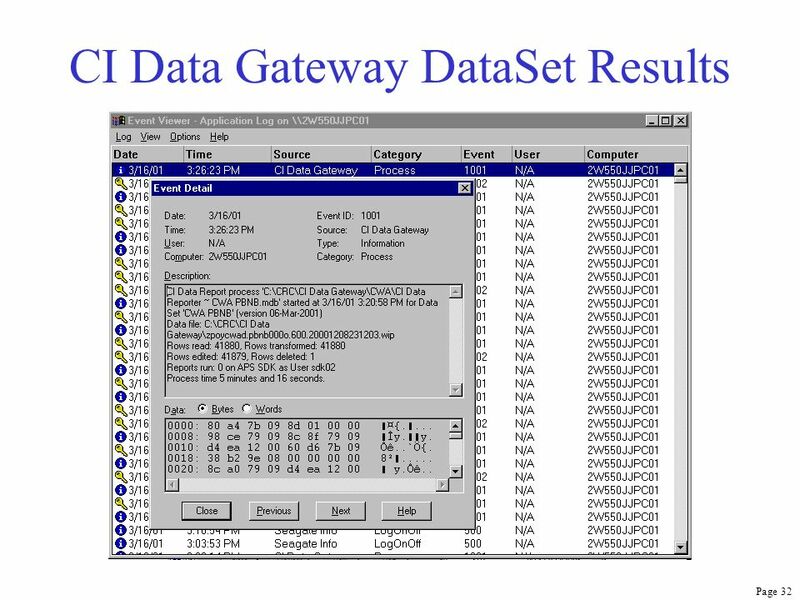 File transfers automatically use data compression to minimize network traffic. 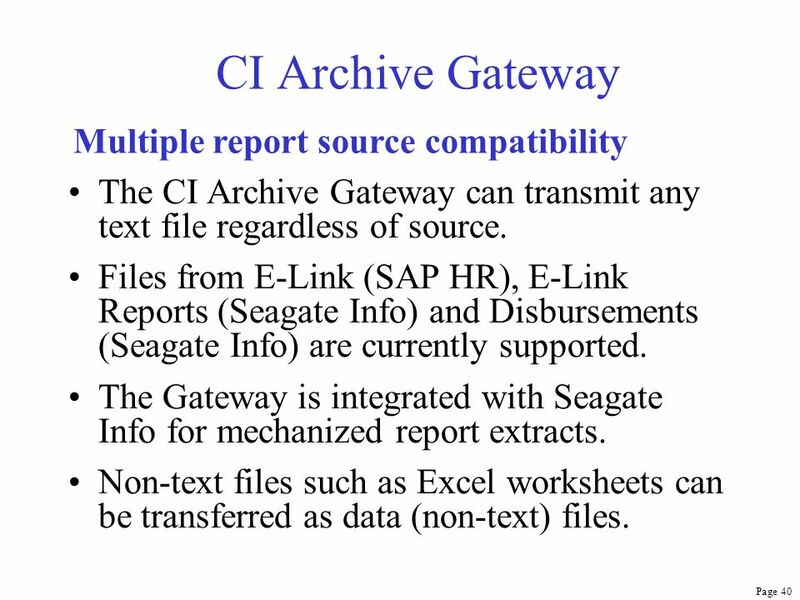 The CI Archive Gateway can transmit any text file regardless of source. 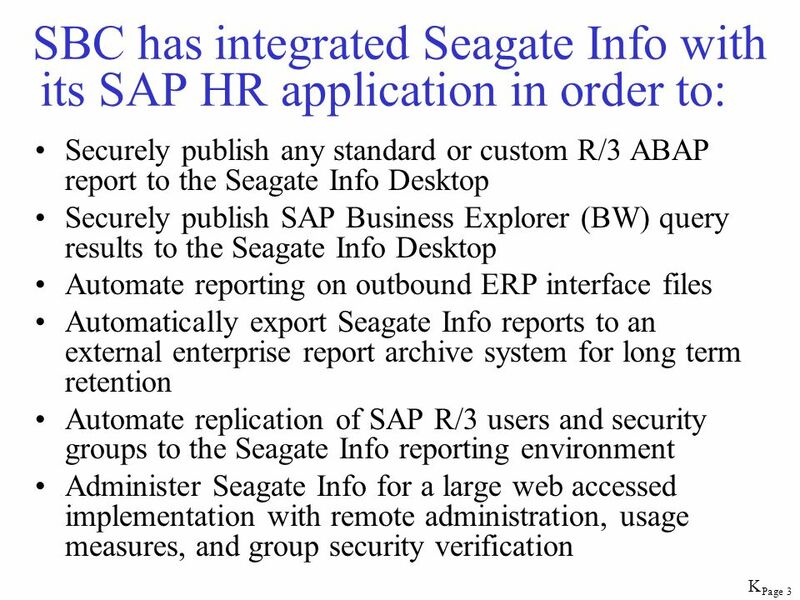 Files from E-Link (SAP HR), E-Link Reports (Seagate Info) and Disbursements (Seagate Info) are currently supported. 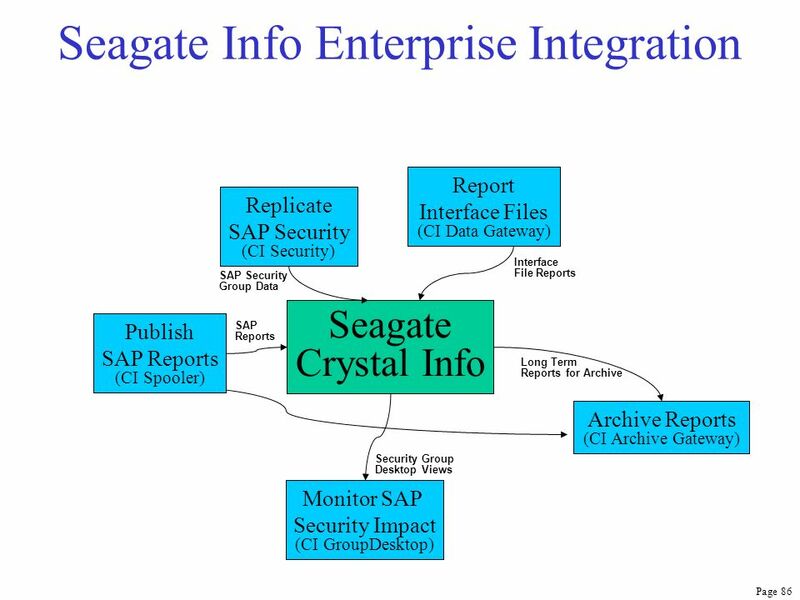 The Gateway is integrated with Seagate Info for mechanized report extracts. 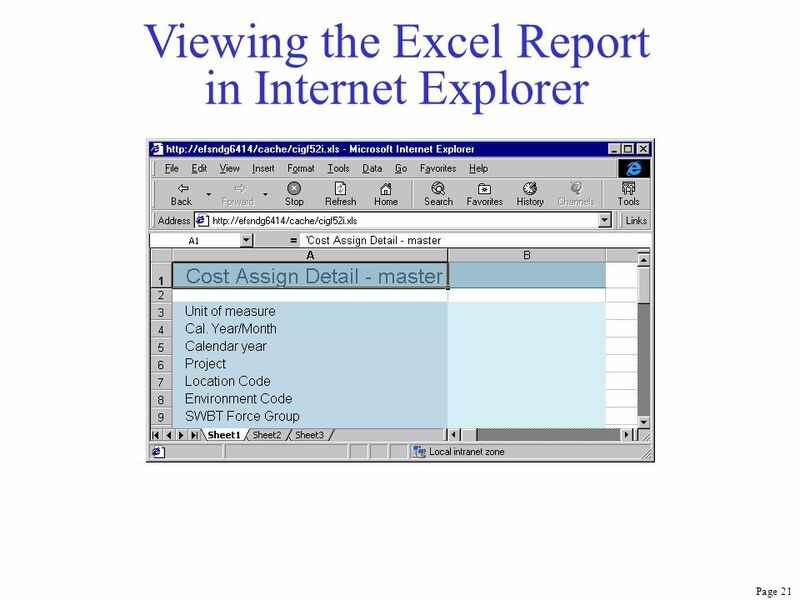 Non-text files such as Excel worksheets can be transferred as data (non-text) files. 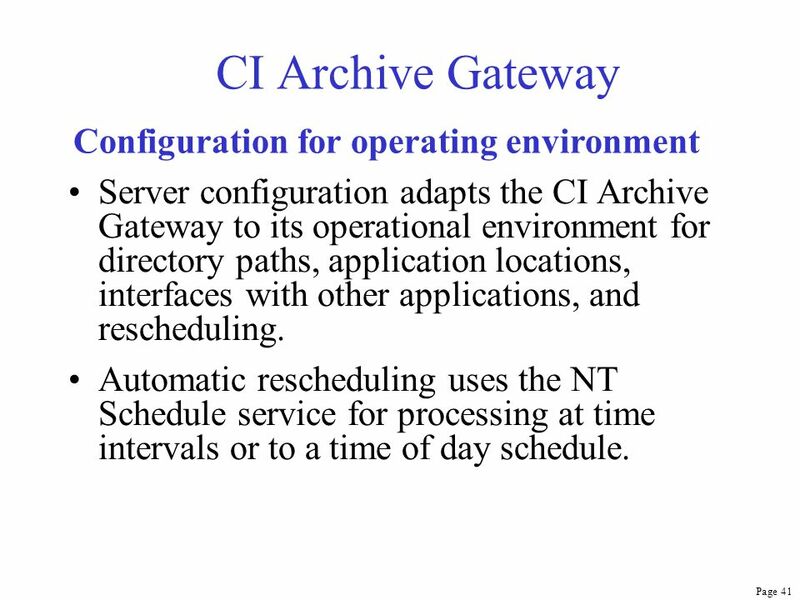 Server configuration adapts the CI Archive Gateway to its operational environment for directory paths, application locations, interfaces with other applications, and rescheduling. Automatic rescheduling uses the NT Schedule service for processing at time intervals or to a time of day schedule. Each file to be archived is identified by file name. 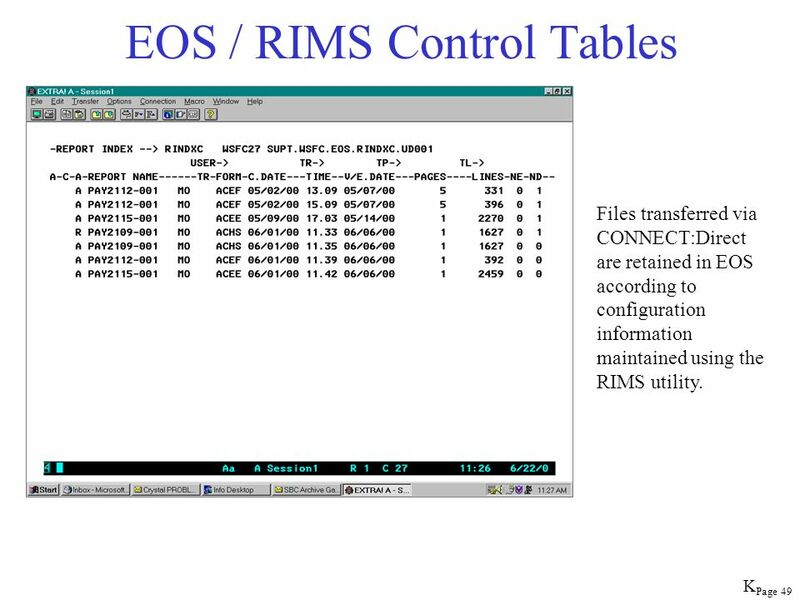 The file identification links the file to a control table that describes how the file is to be processed. 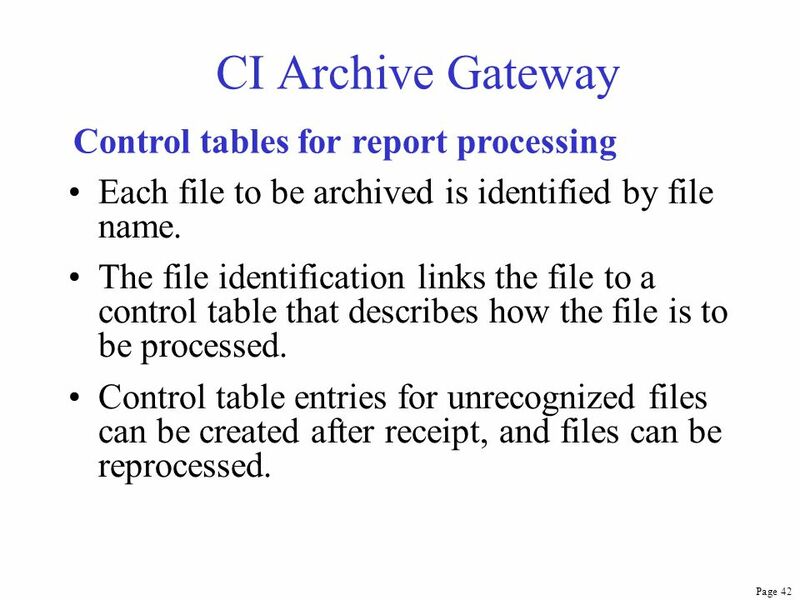 Control table entries for unrecognized files can be created after receipt, and files can be reprocessed. 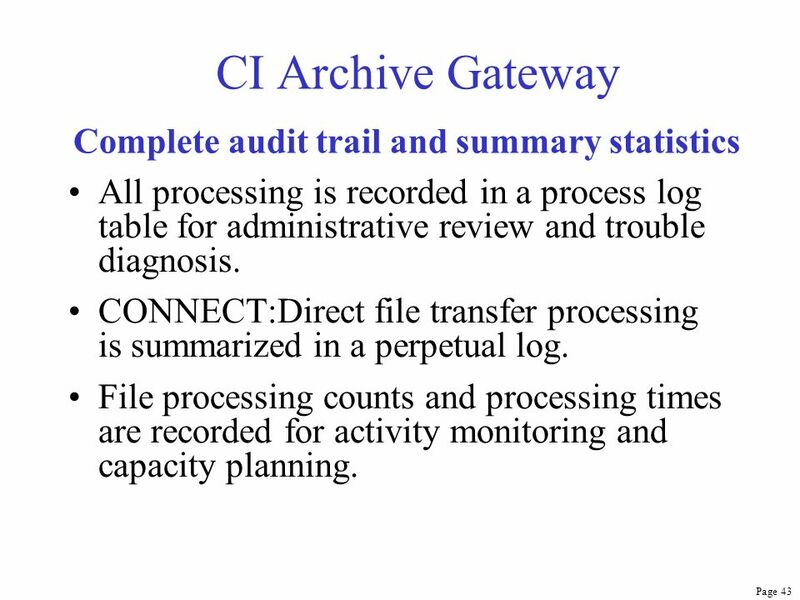 All processing is recorded in a process log table for administrative review and trouble diagnosis. 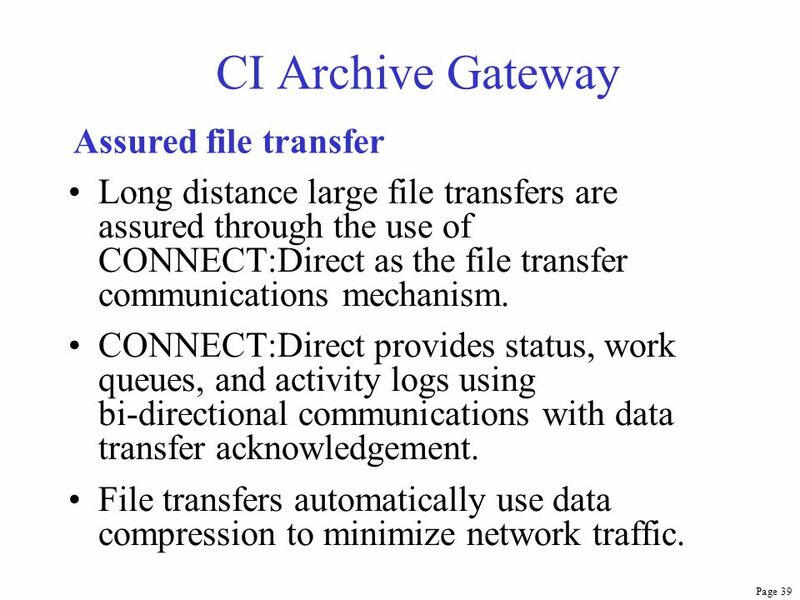 CONNECT:Direct file transfer processing is summarized in a perpetual log. 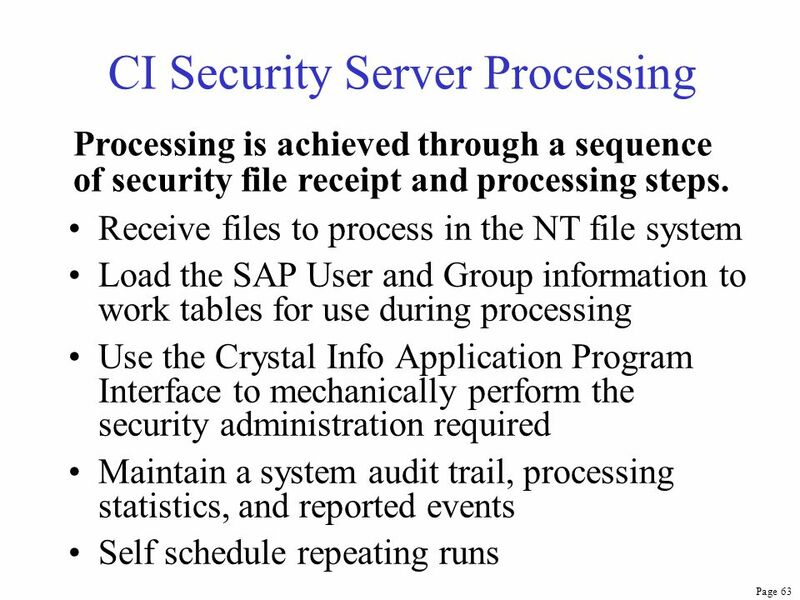 File processing counts and processing times are recorded for activity monitoring and capacity planning. 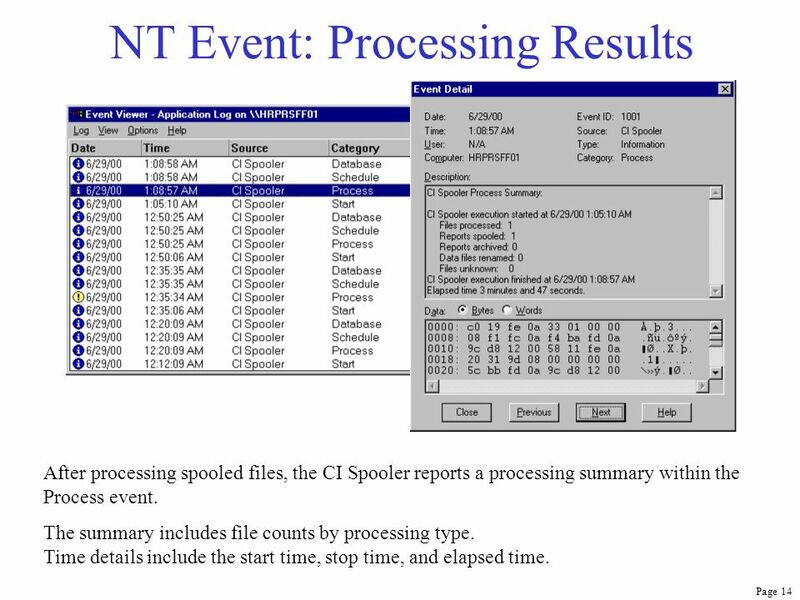 Processing is reported to the NT Event Log and stored in the system’s Application Event database. 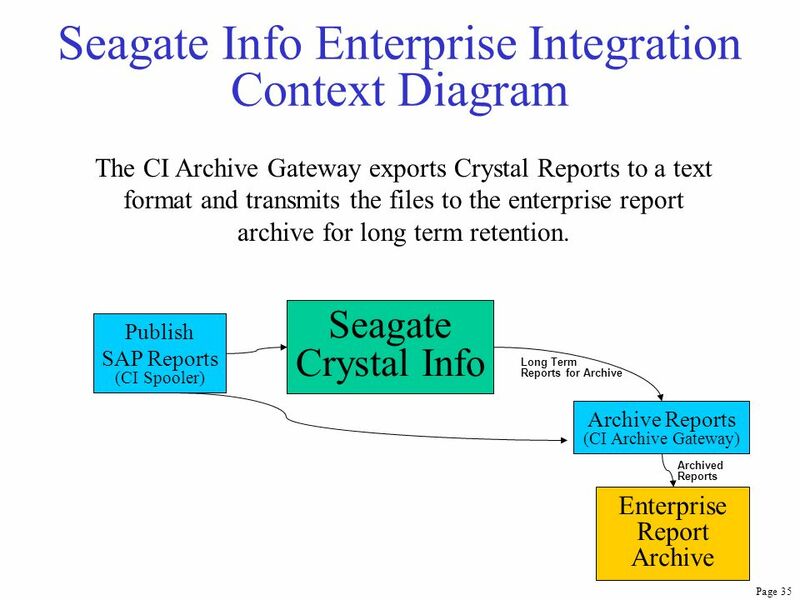 Reported events include: Start, Processing Files Received, Processing Seagate Info Extracts, File Transfers, and Scheduling. 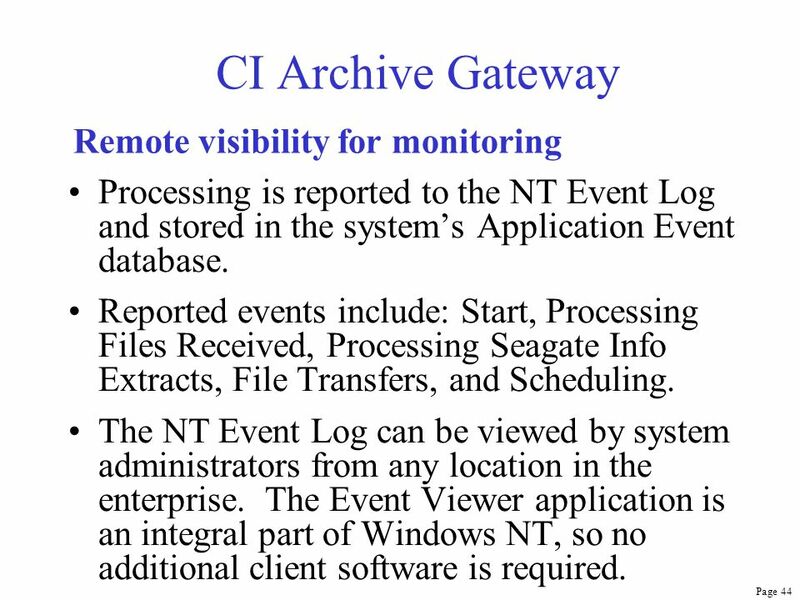 The NT Event Log can be viewed by system administrators from any location in the enterprise. 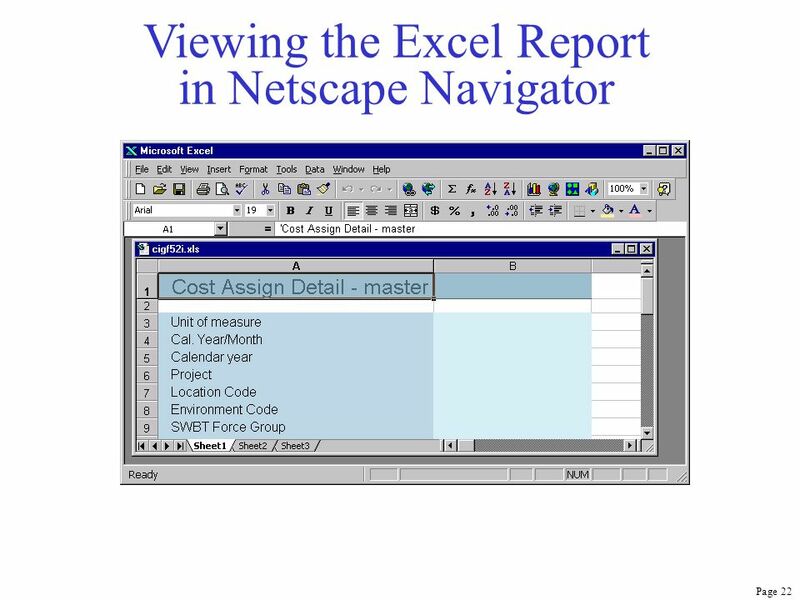 The Event Viewer application is an integral part of Windows NT, so no additional client software is required. 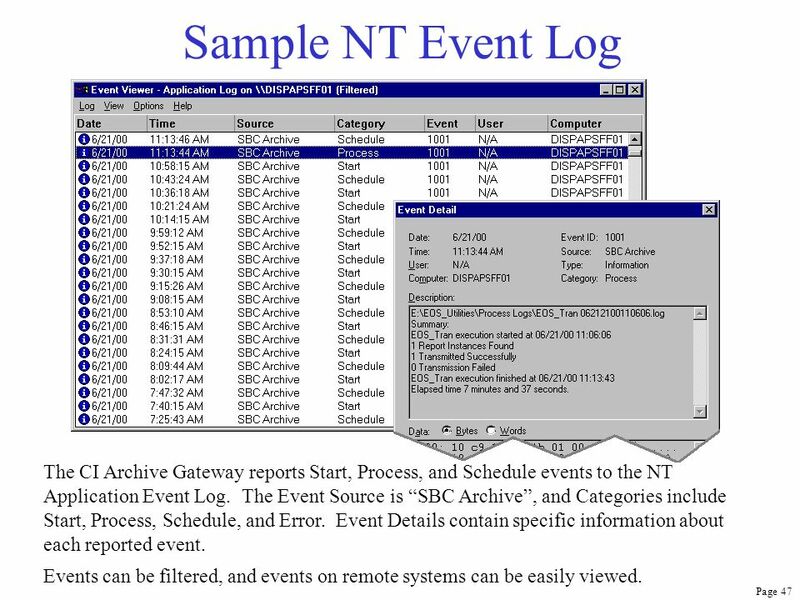 47 Sample NT Event Log The CI Archive Gateway reports Start, Process, and Schedule events to the NT Application Event Log. 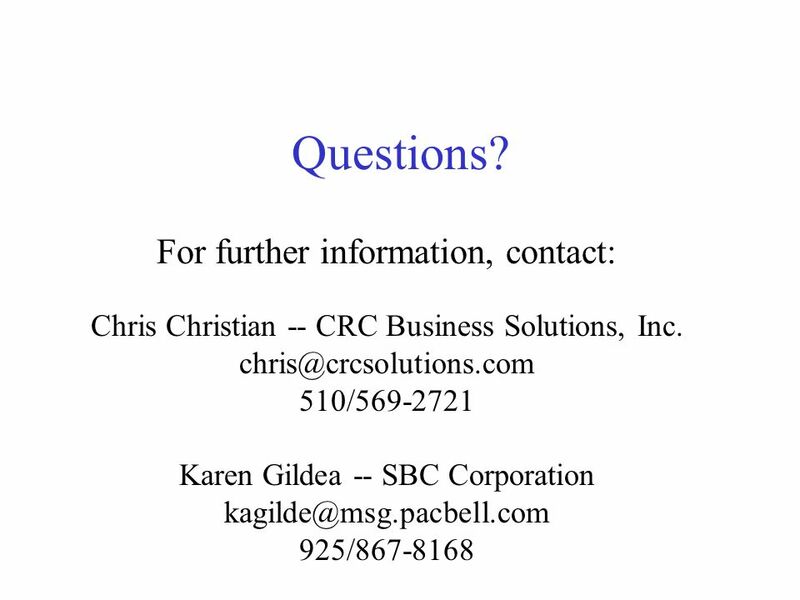 The Event Source is “SBC Archive”, and Categories include Start, Process, Schedule, and Error. Event Details contain specific information about each reported event. Events can be filtered, and events on remote systems can be easily viewed. 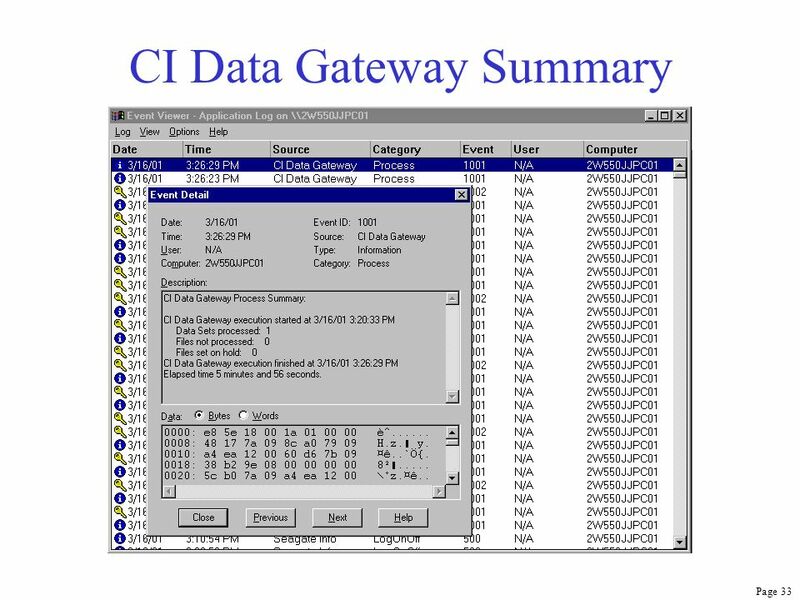 50 CI Archive Gateway Questions? 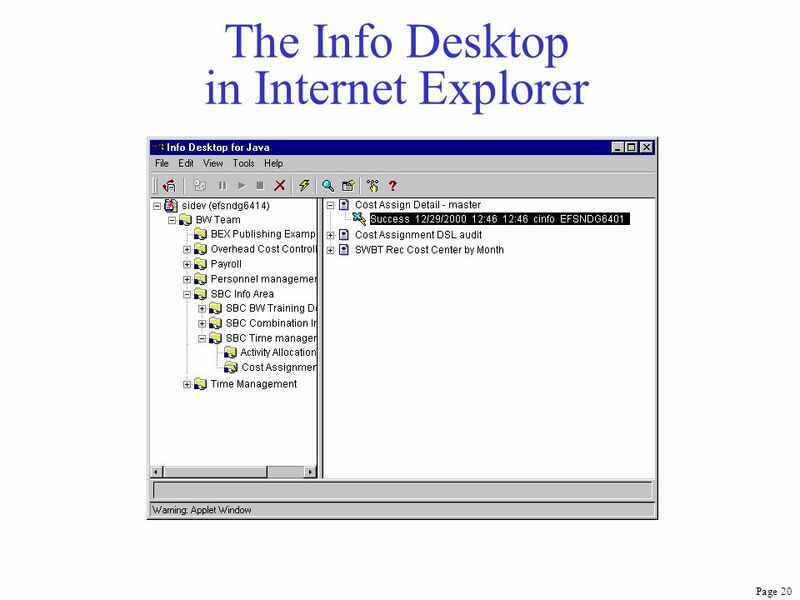 Automated application server schedules and runs unattended. 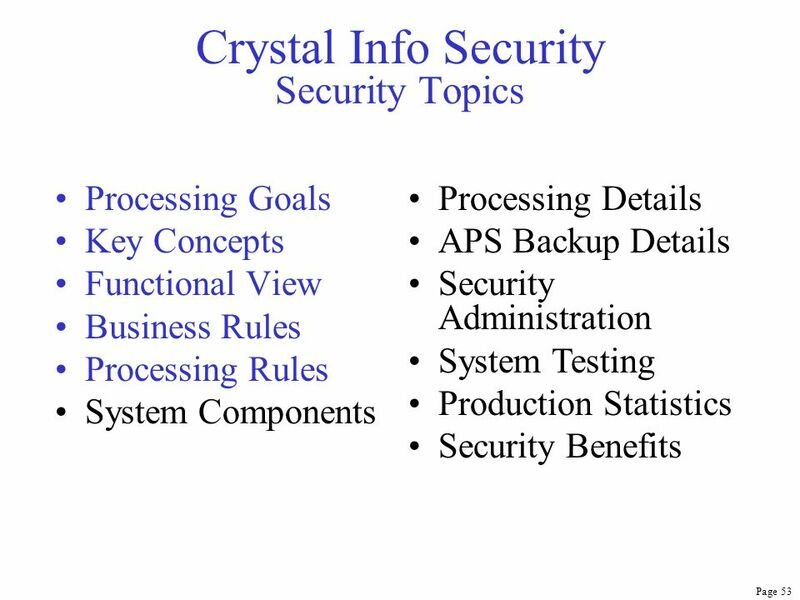 Security processing requires one-time configuration and minimal administration. 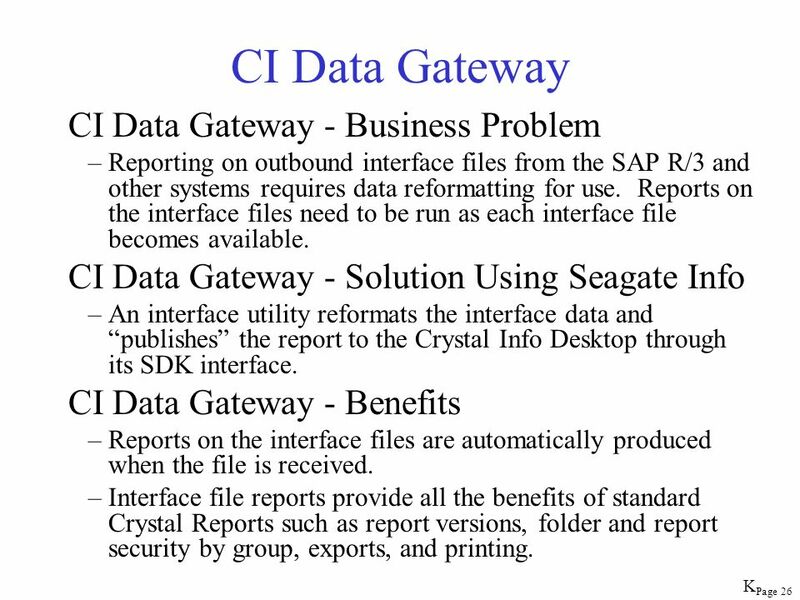 SAP security data extracts are automated. 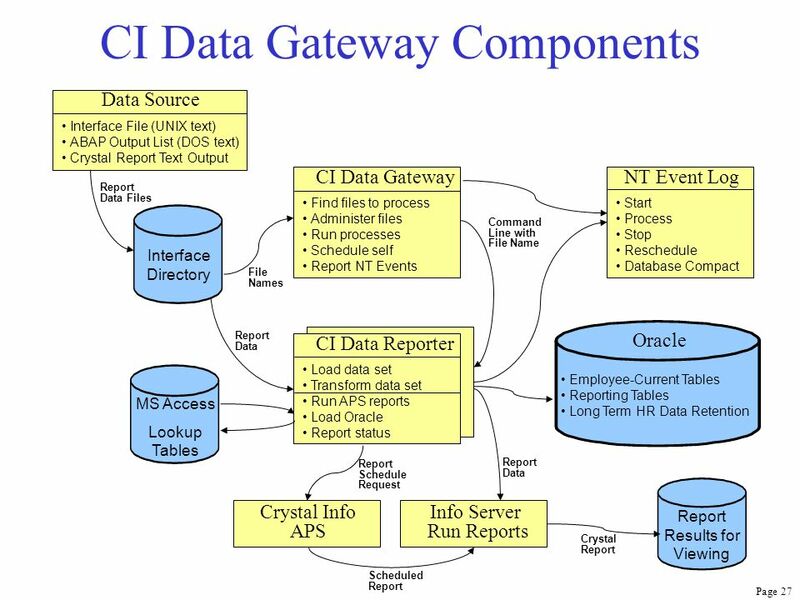 The APS (Crystal Info Desktop) Oracle database is automatically backed up using Oracle’s database utilities. 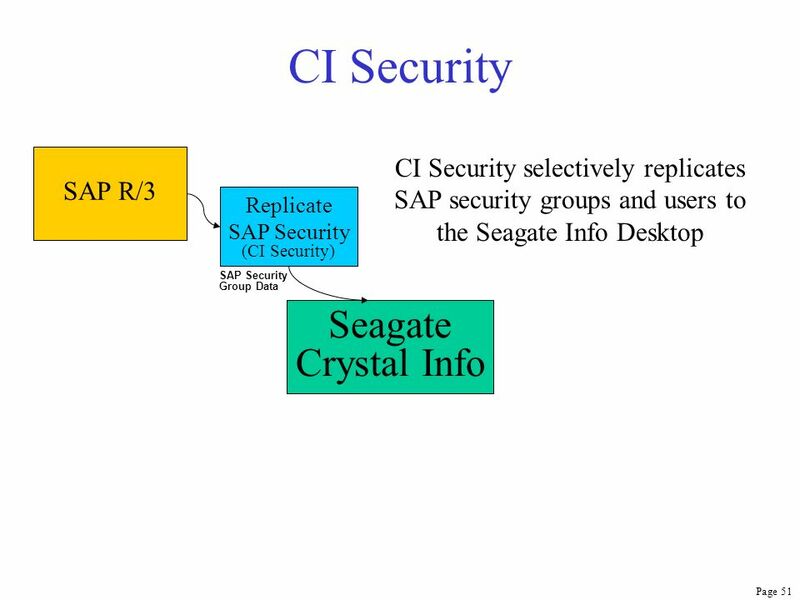 Security updates occur when the required SAP security data files are present. 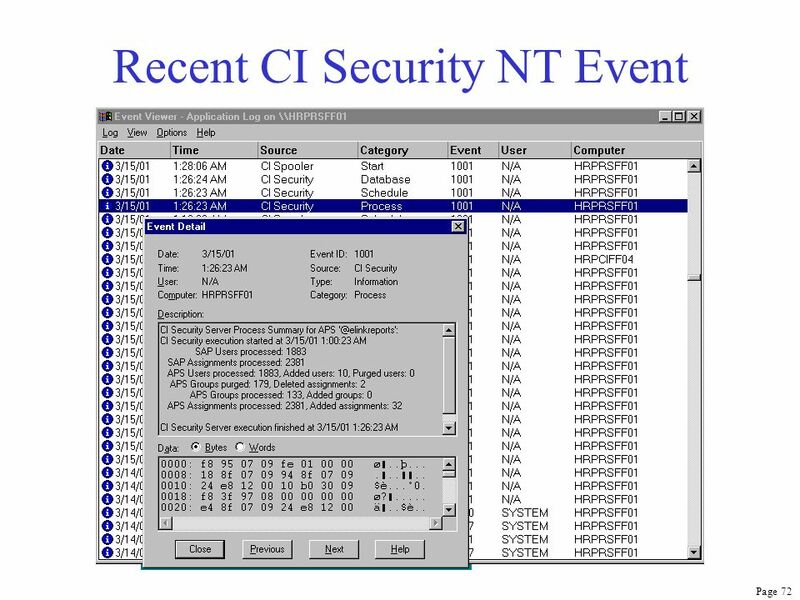 Security processing is completely visible from administrator workstations through the NT Event Log. 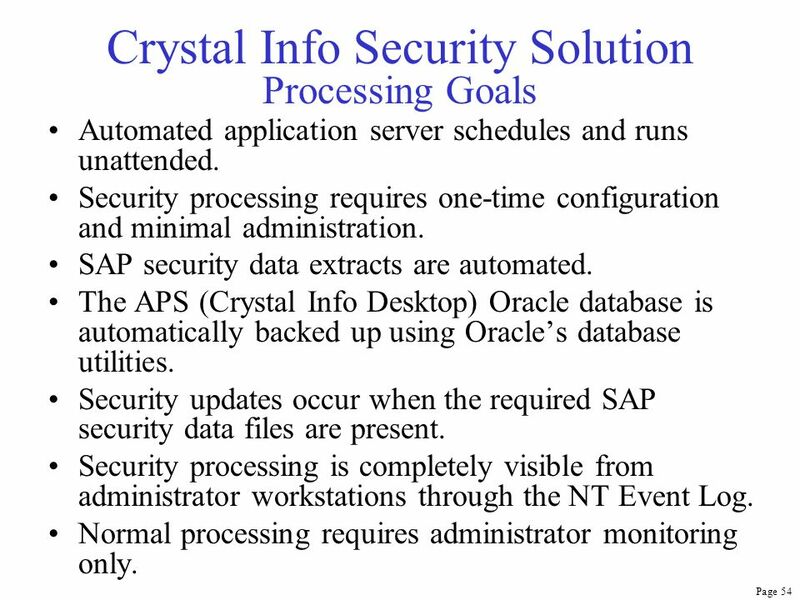 Normal processing requires administrator monitoring only. 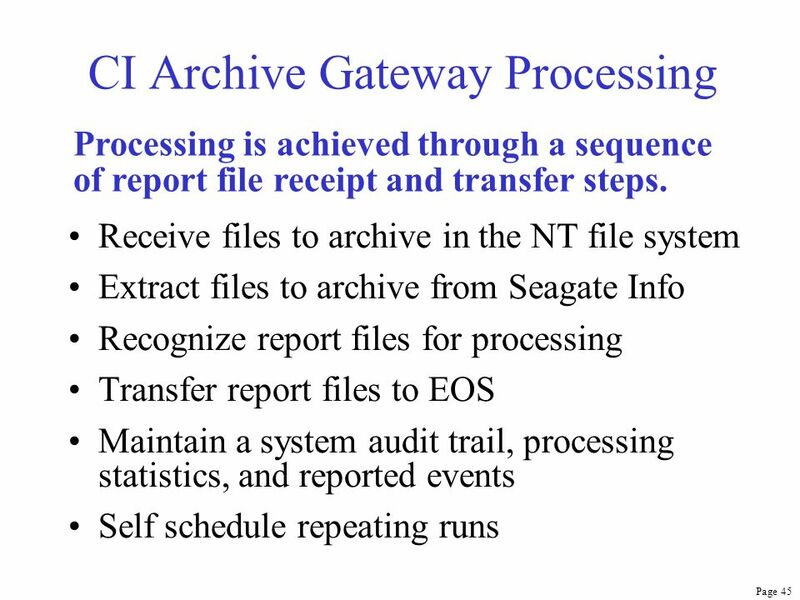 Processing results are detailed in complete processing logs, providing a robust audit trail. 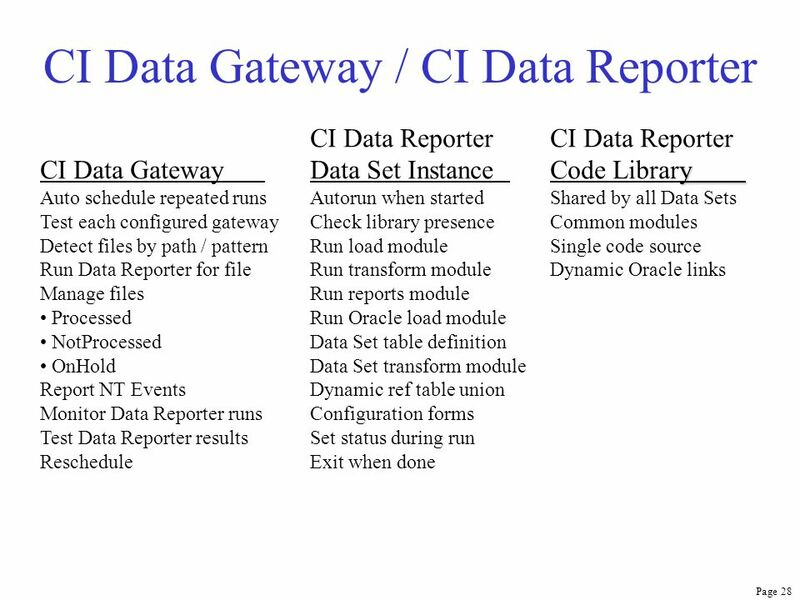 Data generation differences are automatically documented. 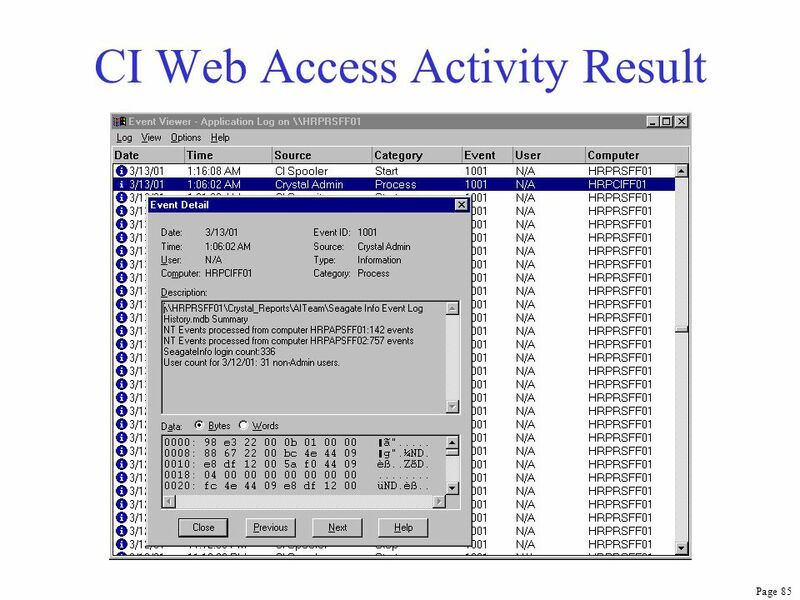 Processing can be undone to immediately restore the security data to its prior state. 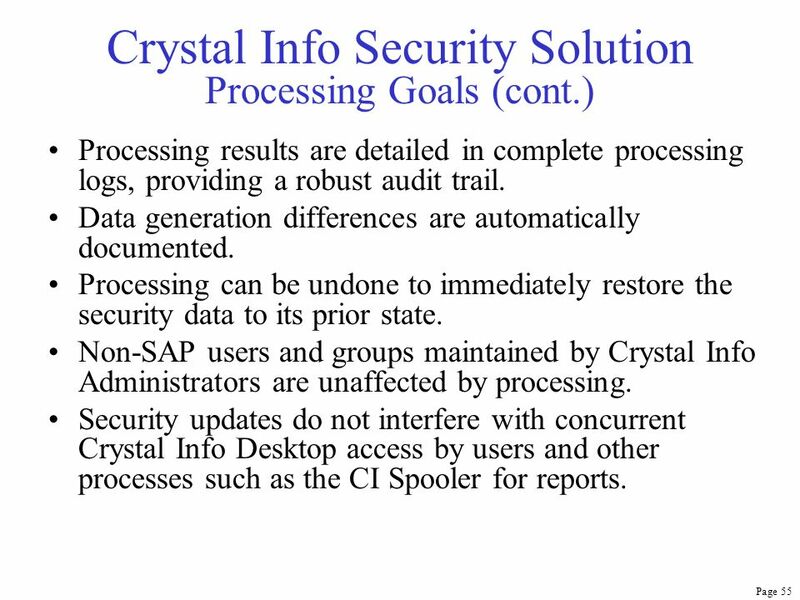 Non-SAP users and groups maintained by Crystal Info Administrators are unaffected by processing. 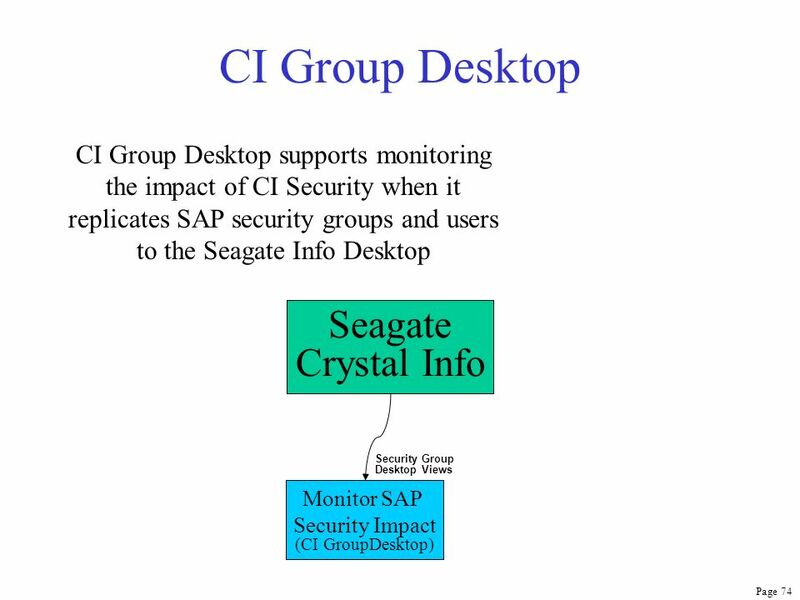 Security updates do not interfere with concurrent Crystal Info Desktop access by users and other processes such as the CI Spooler for reports. 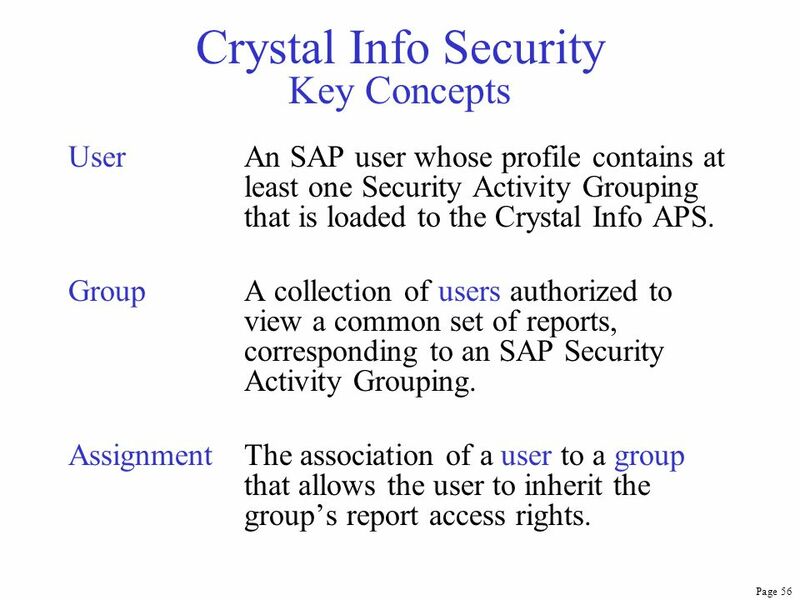 User	An SAP user whose profile contains at least one Security Activity Grouping that is loaded to the Crystal Info APS. 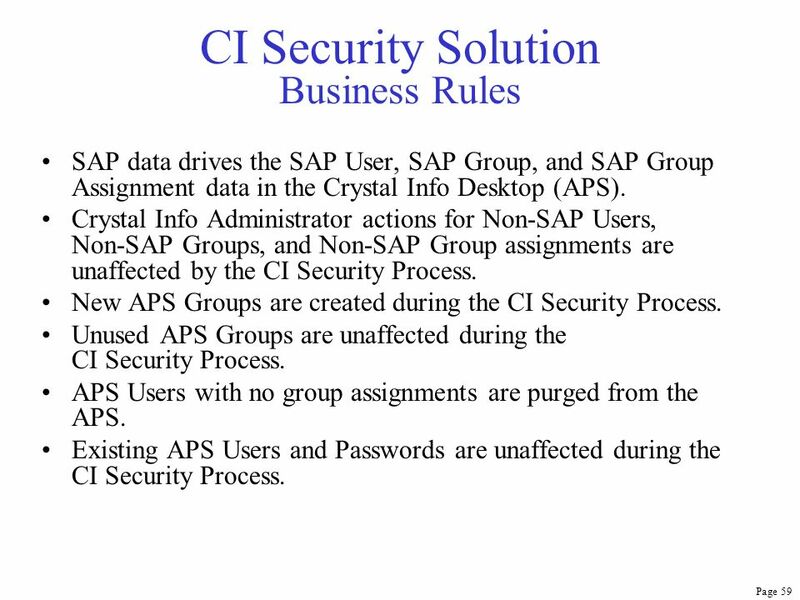 Group	A collection of users authorized to view a common set of reports, corresponding to an SAP Security Activity Grouping. Assignment	The association of a user to a group that allows the user to inherit the group’s report access rights. 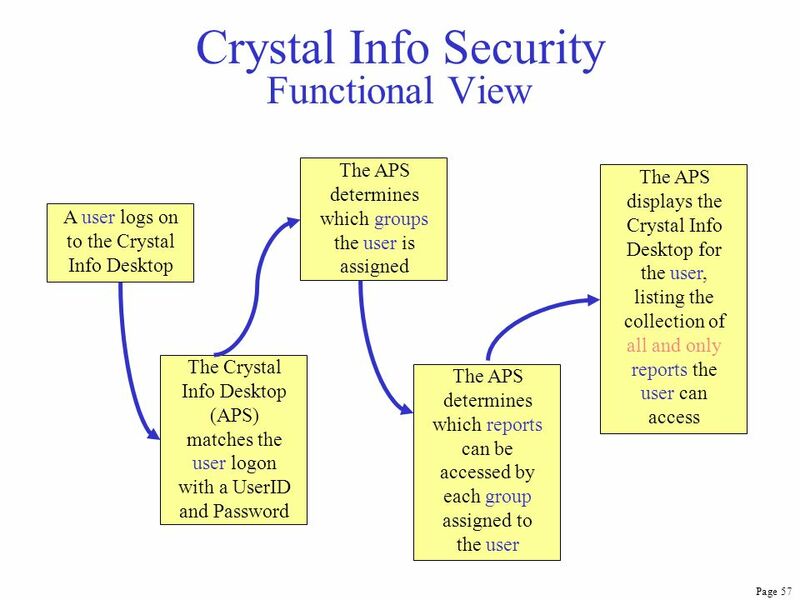 SAP data drives the SAP User, SAP Group, and SAP Group Assignment data in the Crystal Info Desktop (APS). 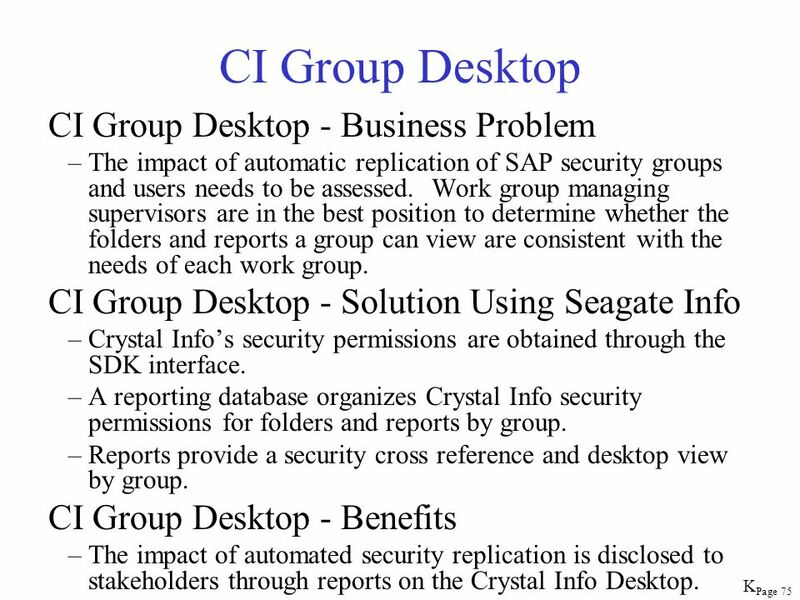 Crystal Info Administrator actions for Non-SAP Users, Non-SAP Groups, and Non-SAP Group assignments are unaffected by the CI Security Process. New APS Groups are created during the CI Security Process. 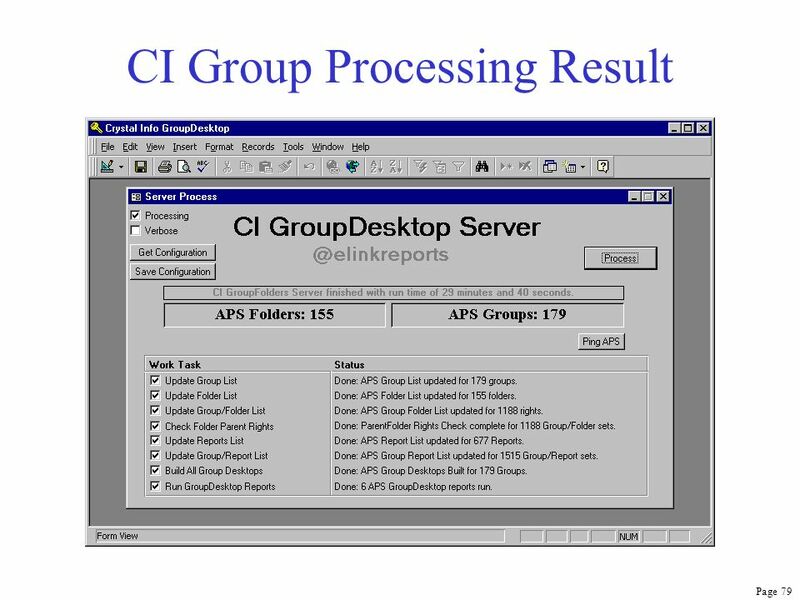 Unused APS Groups are unaffected during the CI Security Process. APS Users with no group assignments are purged from the APS. 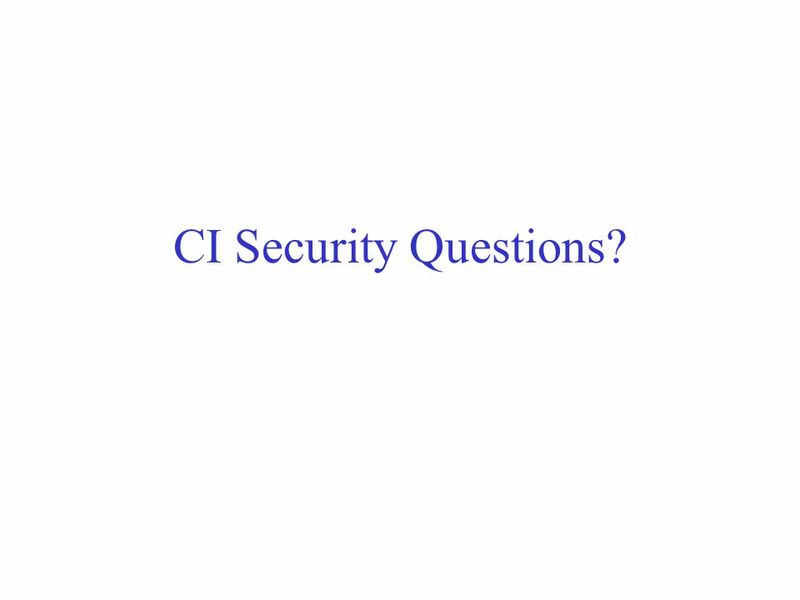 Existing APS Users and Passwords are unaffected during the CI Security Process. 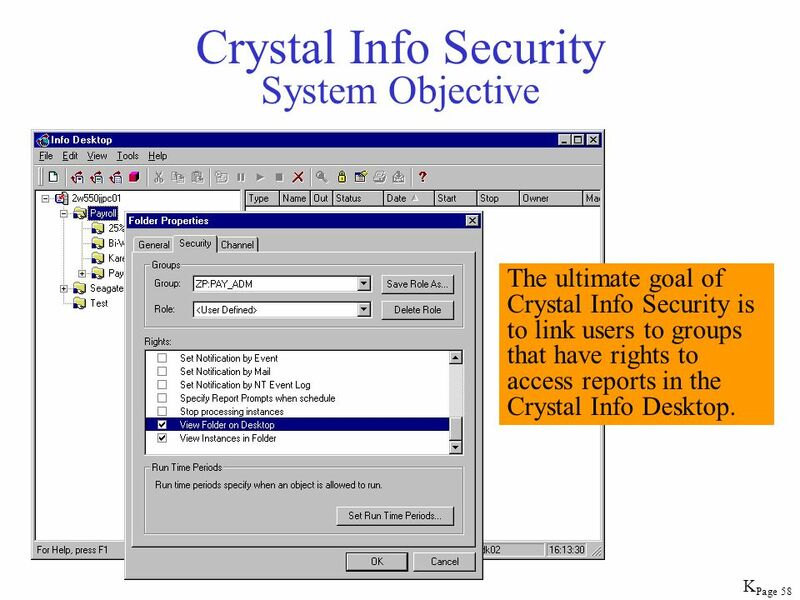 Security updates occur online during concurrent system access by Crystal Info Desktop users and other processes such as the CI Spooler for reports. 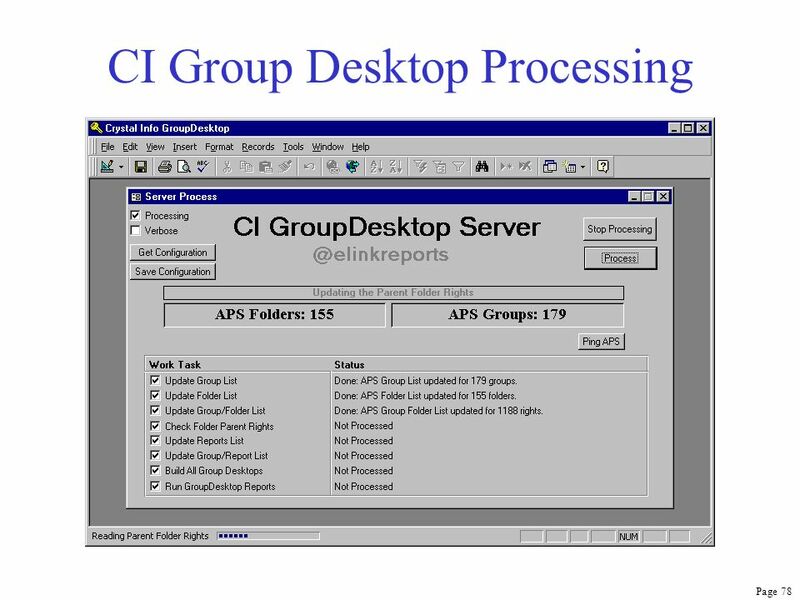 An APS Database Backup must be successfully performed before CI Security Processing can start. 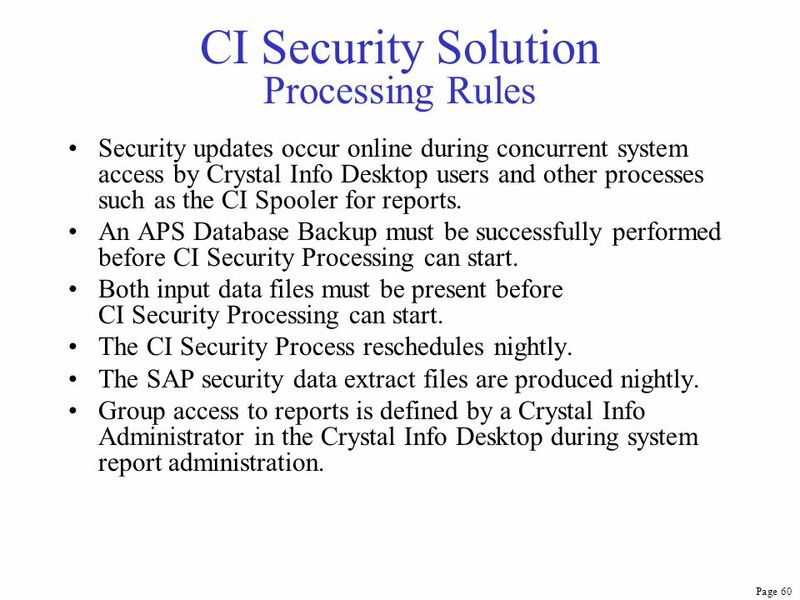 Both input data files must be present before CI Security Processing can start. 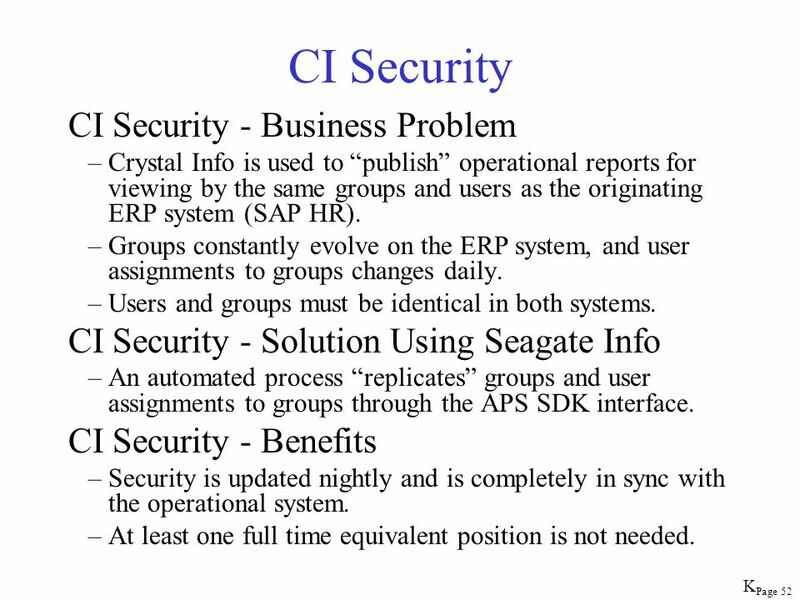 The CI Security Process reschedules nightly. 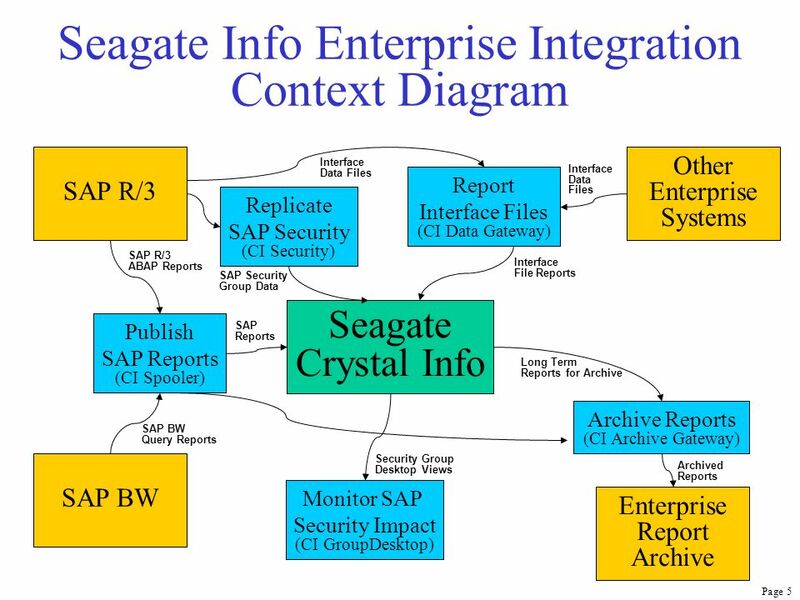 The SAP security data extract files are produced nightly. 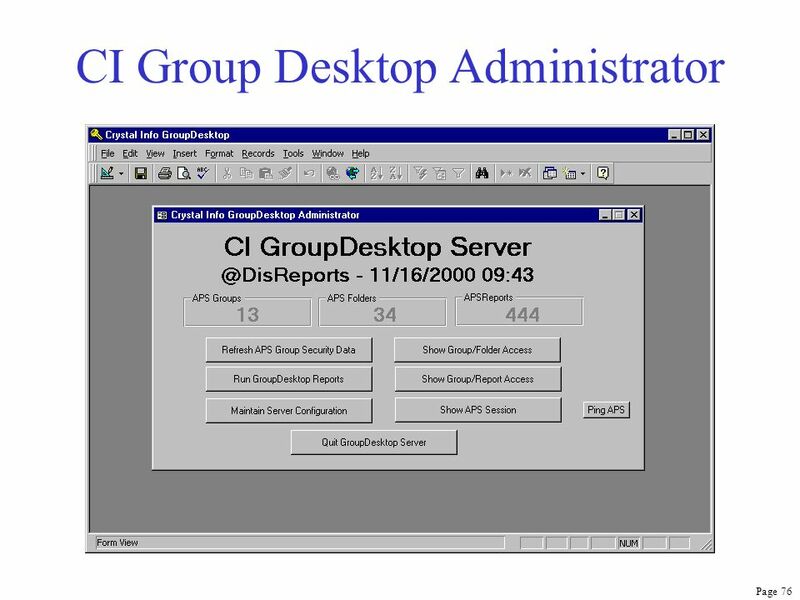 Group access to reports is defined by a Crystal Info Administrator in the Crystal Info Desktop during system report administration. 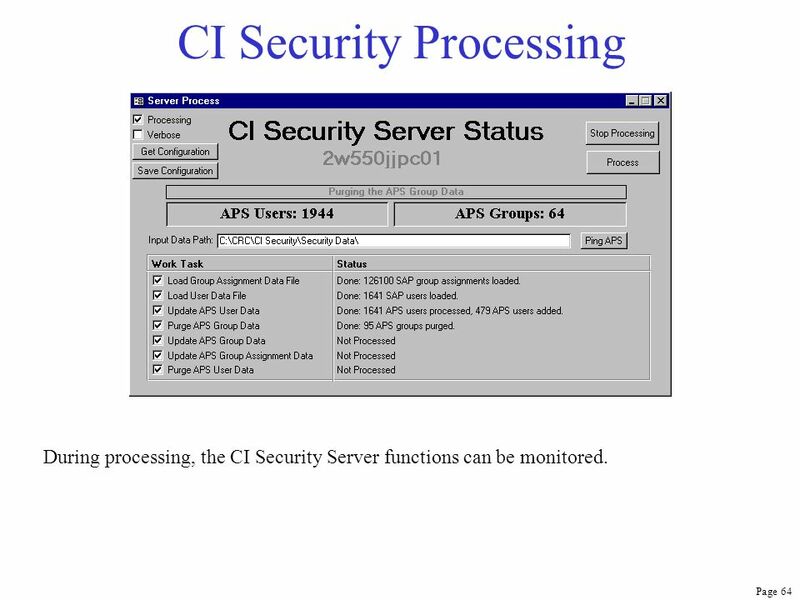 During processing, the CI Security Server functions can be monitored. 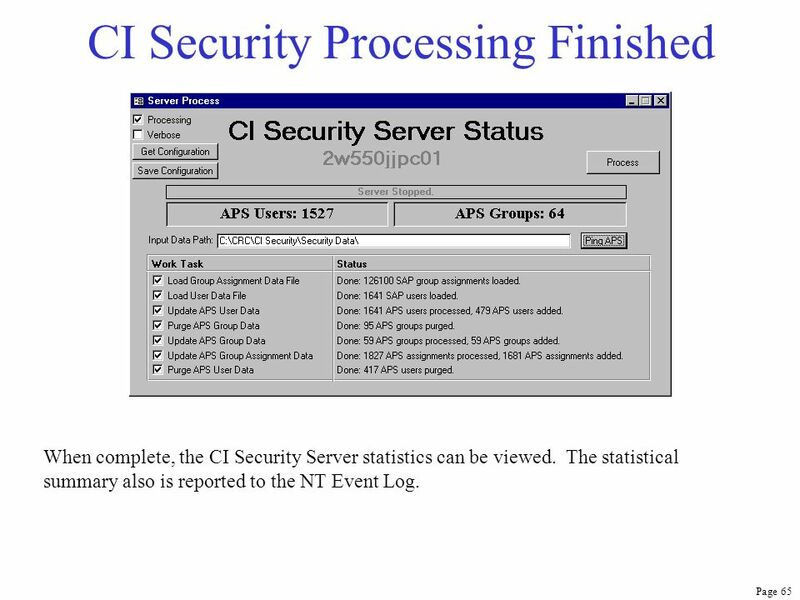 When complete, the CI Security Server statistics can be viewed. The statistical summary also is reported to the NT Event Log. 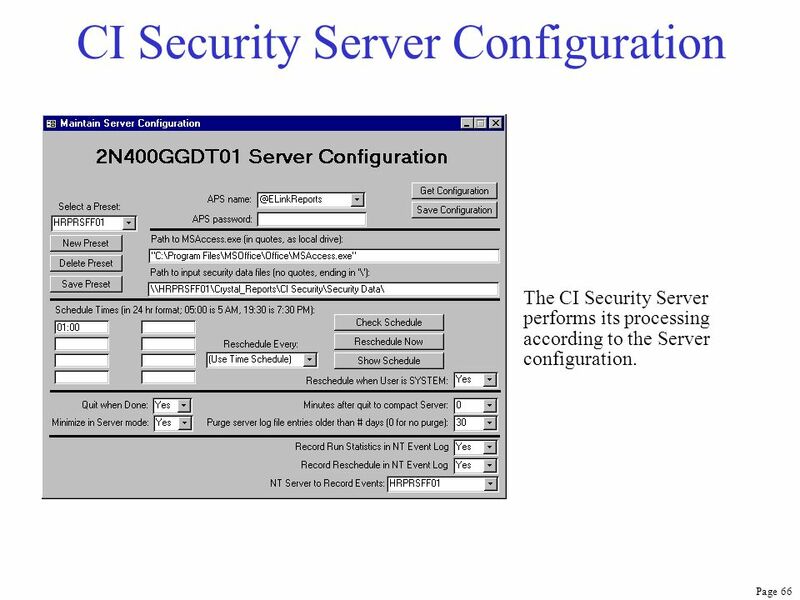 The CI Security Server performs its processing according to the Server configuration. 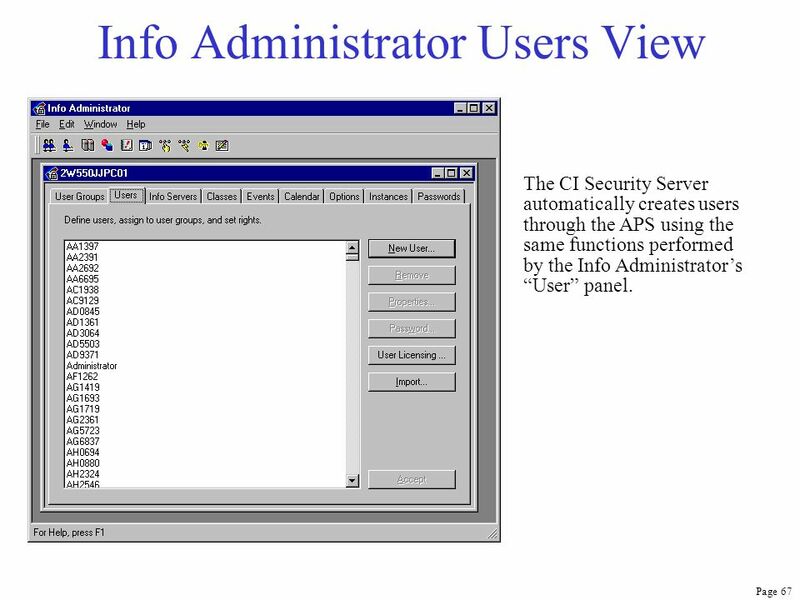 The CI Security Server automatically creates users through the APS using the same functions performed by the Info Administrator’s “User” panel. 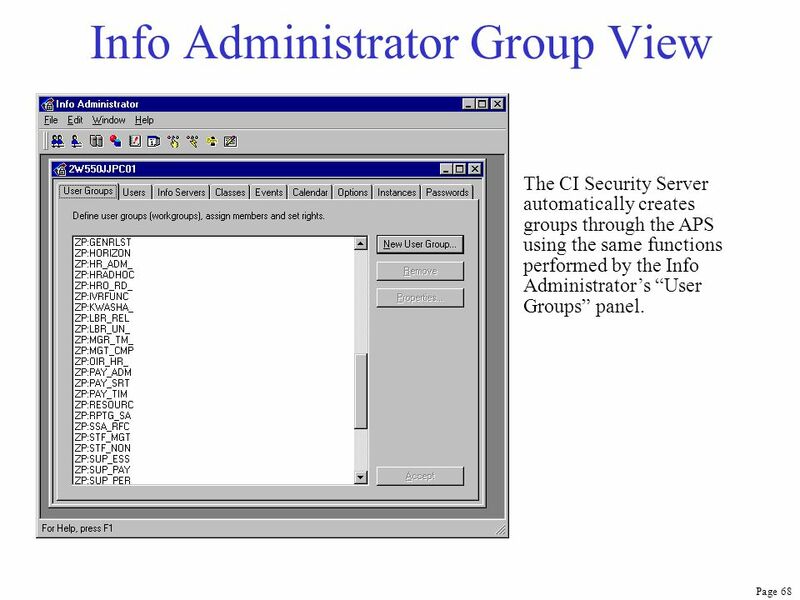 The CI Security Server automatically creates groups through the APS using the same functions performed by the Info Administrator’s “User Groups” panel. 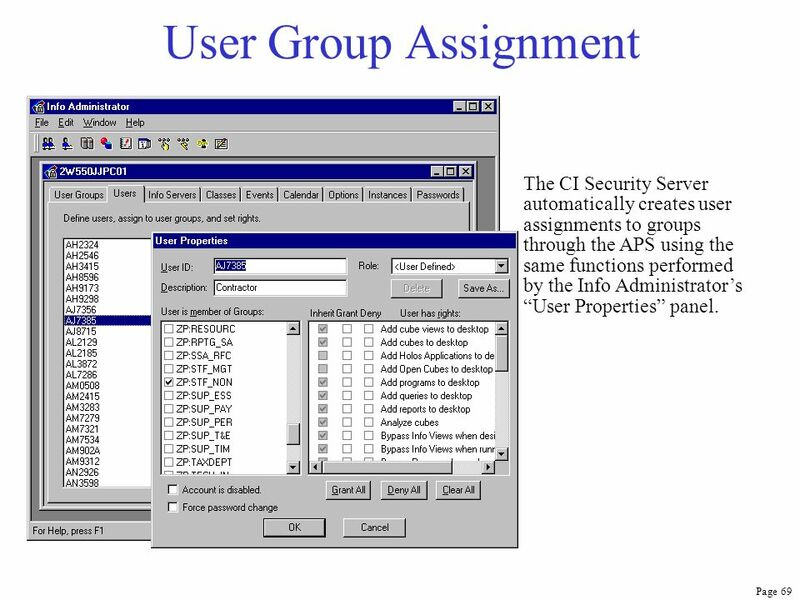 69 User Group Assignment The CI Security Server automatically creates user assignments to groups through the APS using the same functions performed by the Info Administrator’s “User Properties” panel. 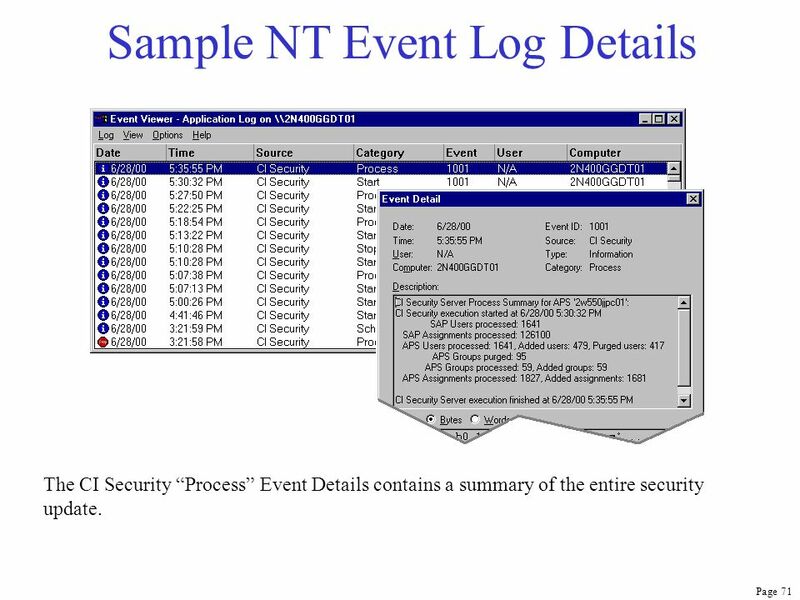 70 Sample NT Event Log The CI Security Server reports Start, Process, and Schedule events to the NT Application Event Log. 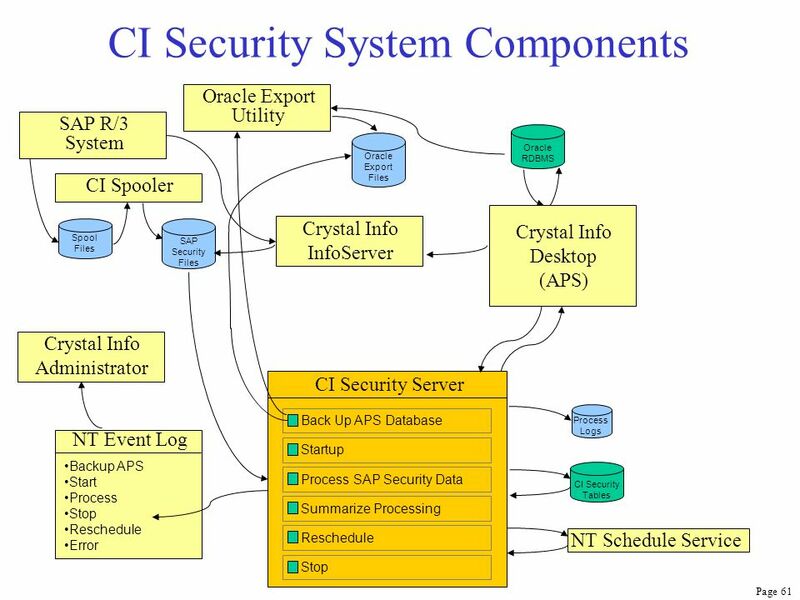 The Event Source is “CI Security”, and Categories include Start, Process, Schedule, and Error. Event Details contain specific information about each reported event. Events can be filtered, and events on remote systems can be easily viewed. 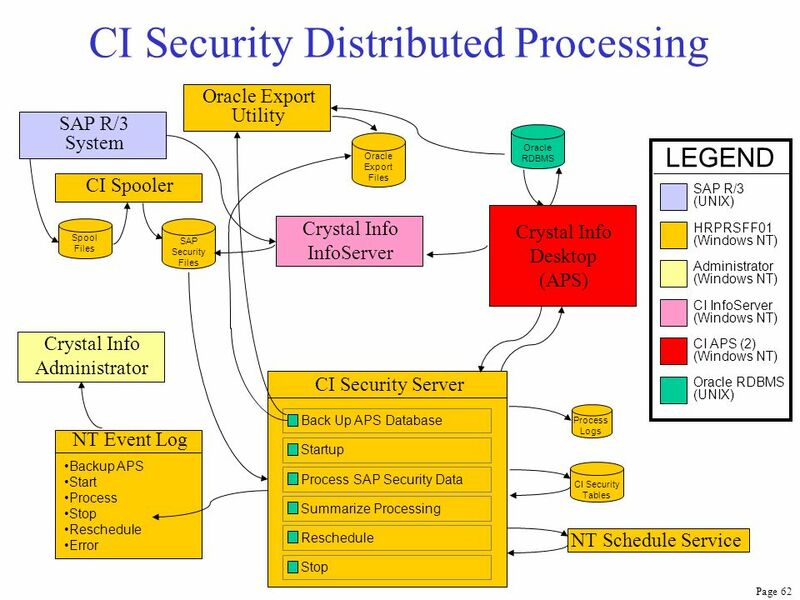 The CI Security “Process” Event Details contains a summary of the entire security update. 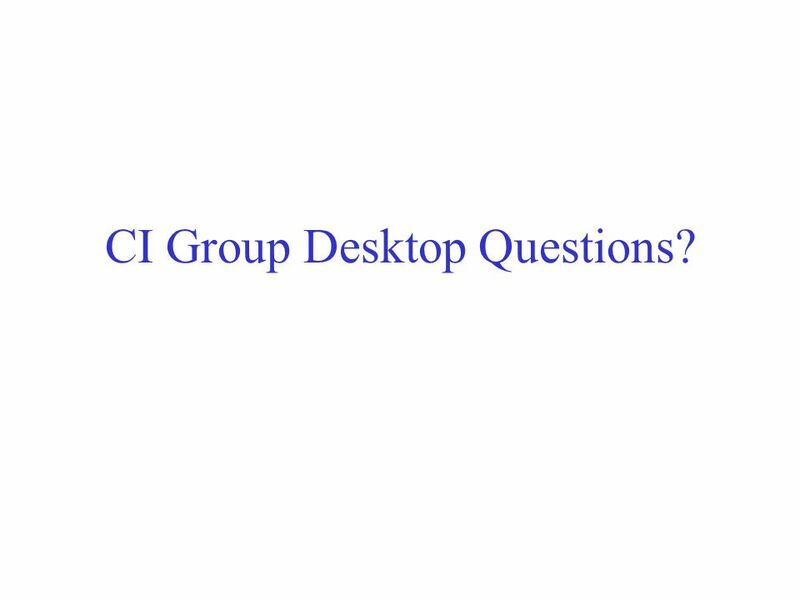 84 CI Group Desktop Questions? 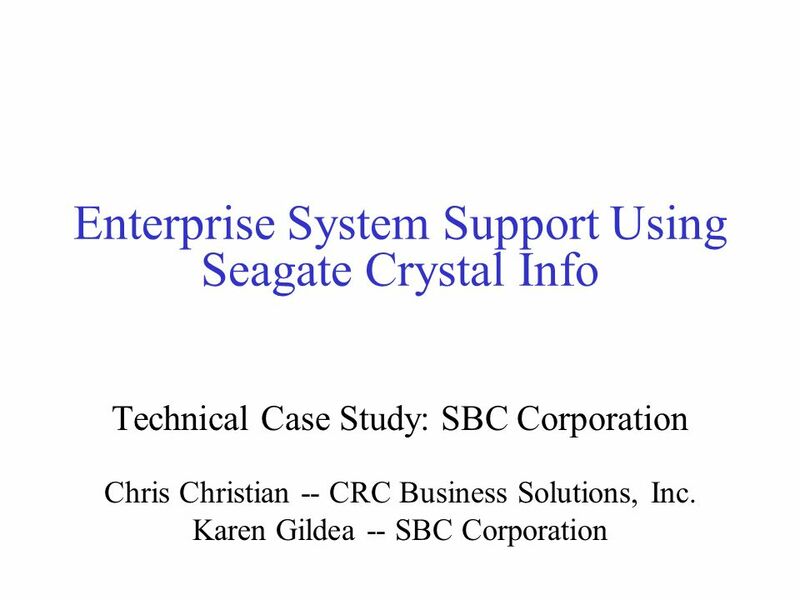 Download ppt "Enterprise System Support Using Seagate Crystal Info"